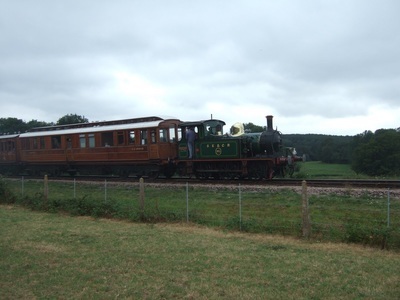 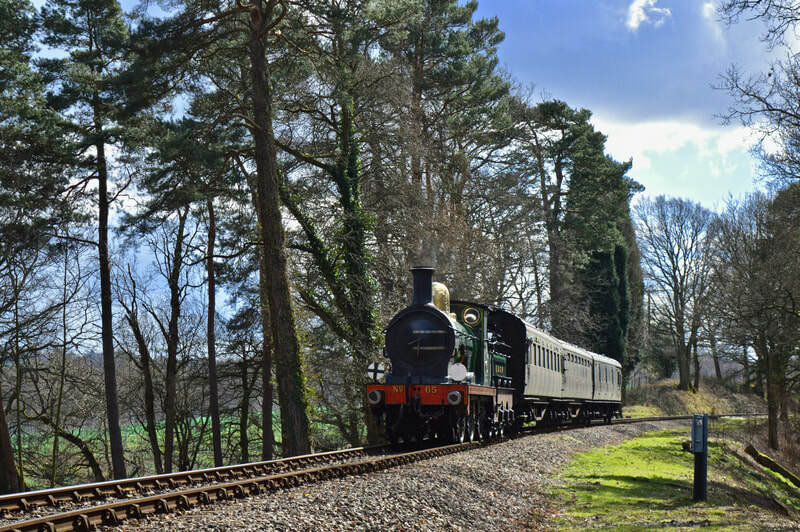 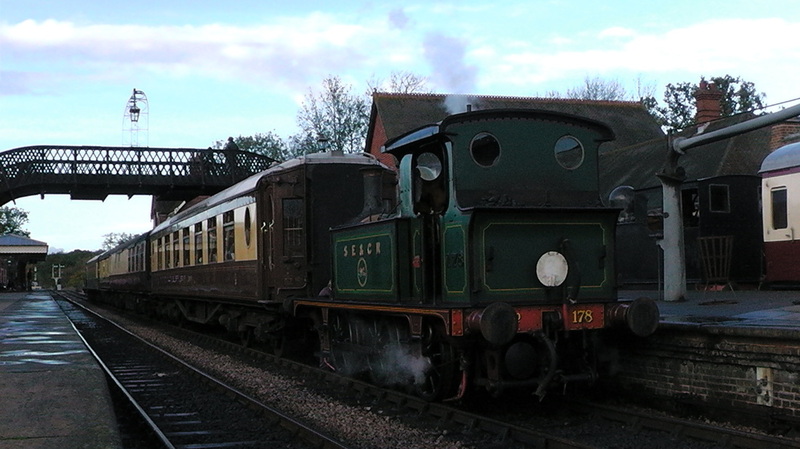 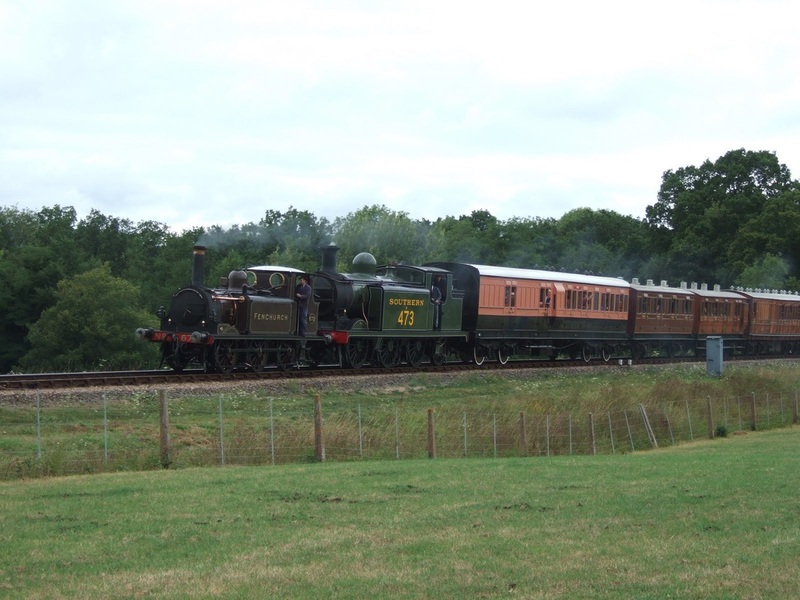 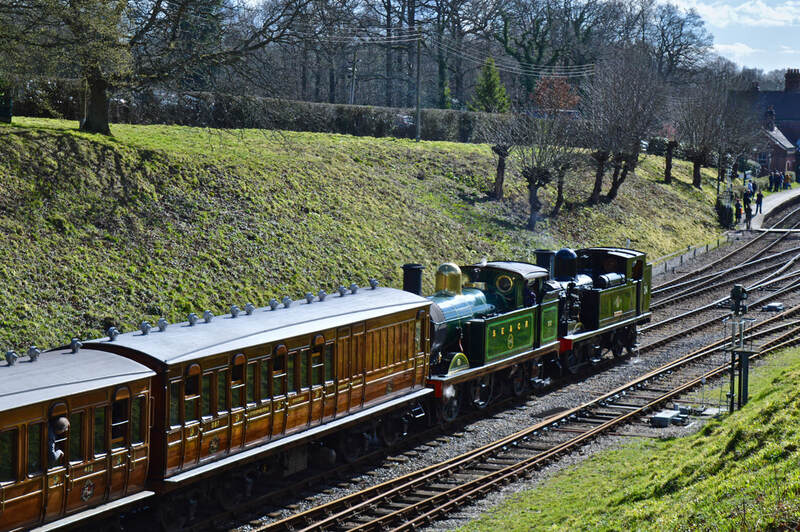 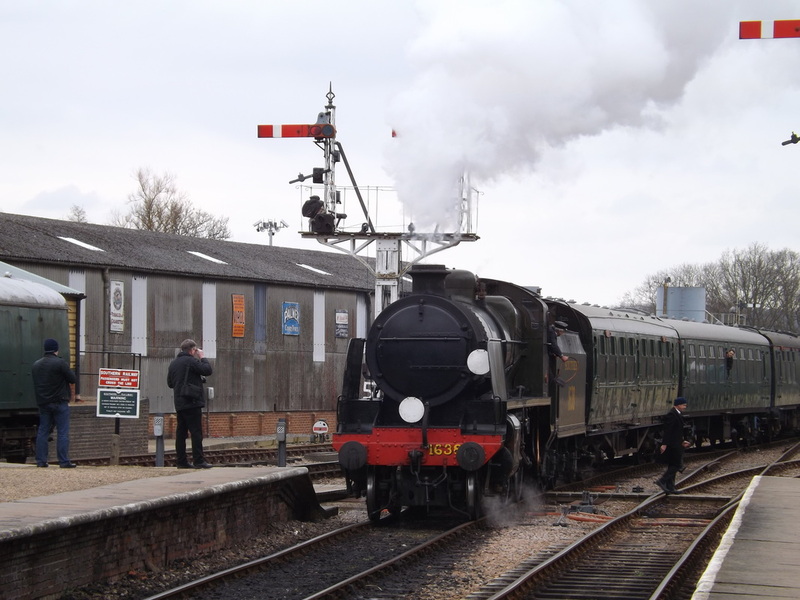 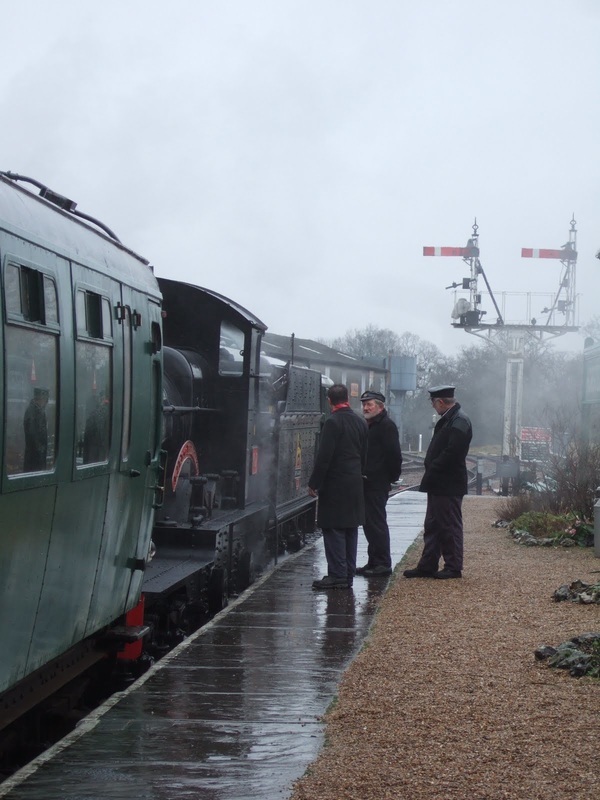 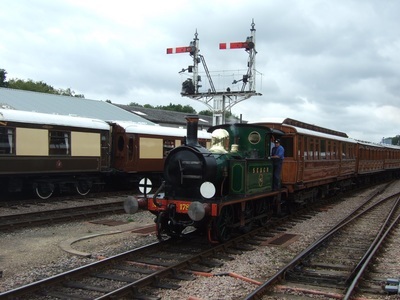 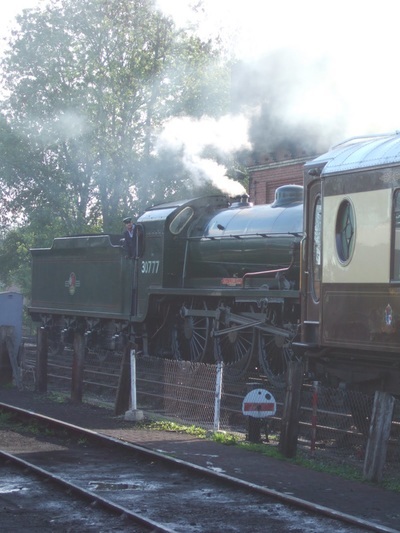 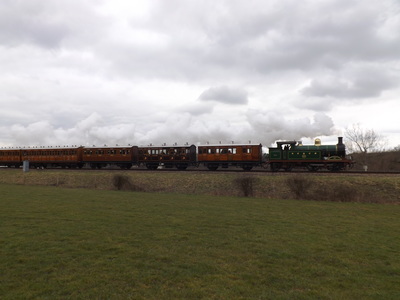 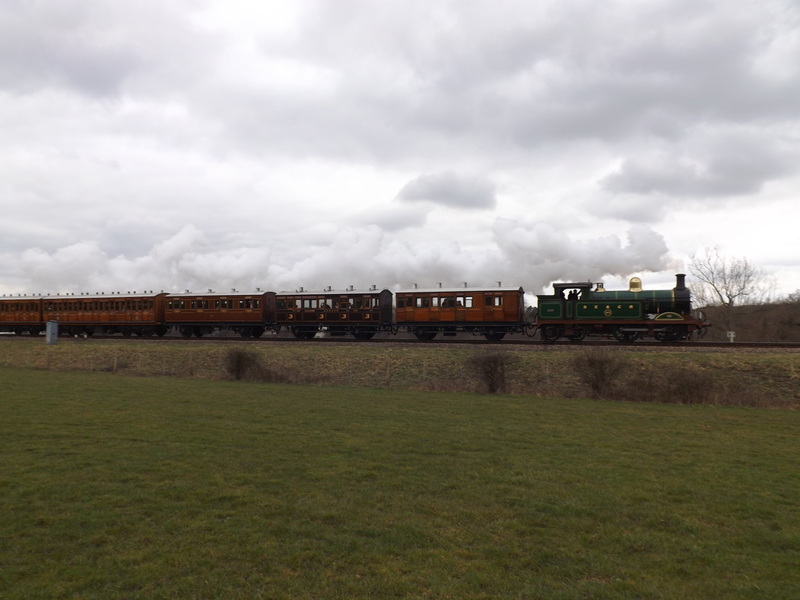 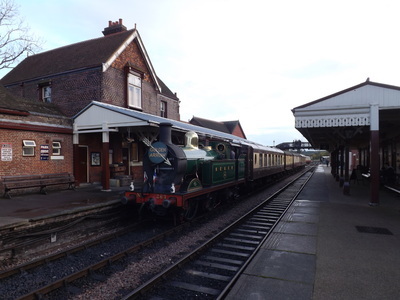 In 1994, the Bluebell Railway's passenger services reached Kingscote station, nine years later they finally extended north again. 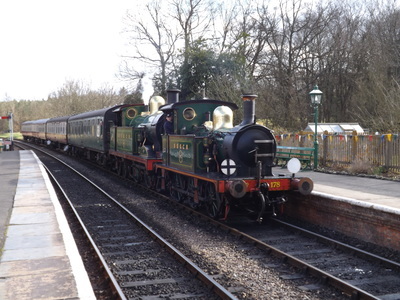 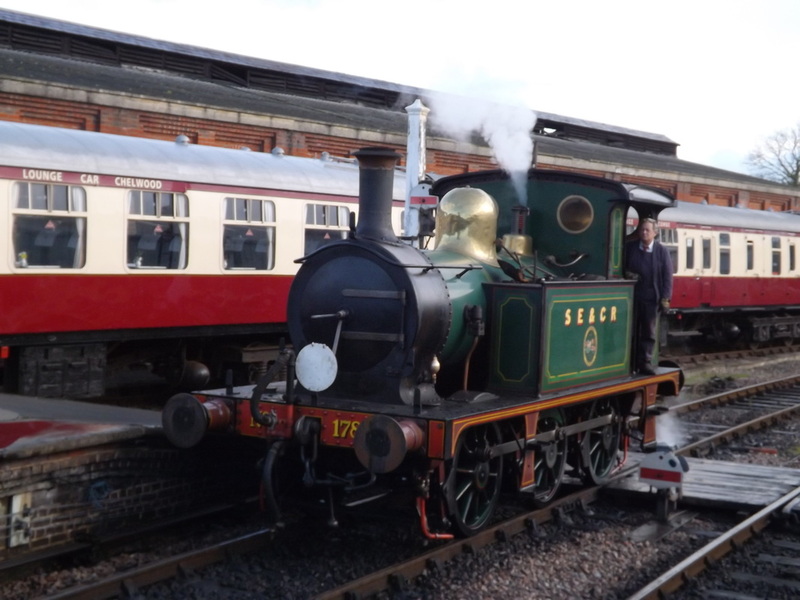 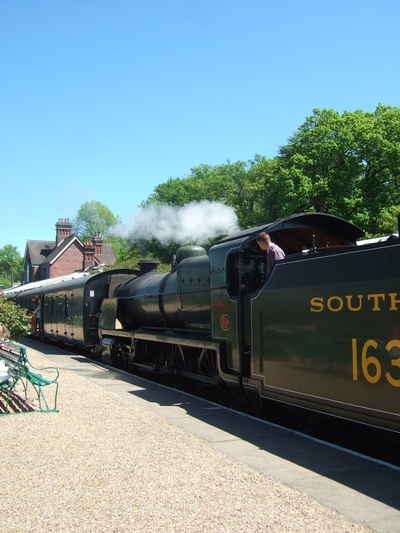 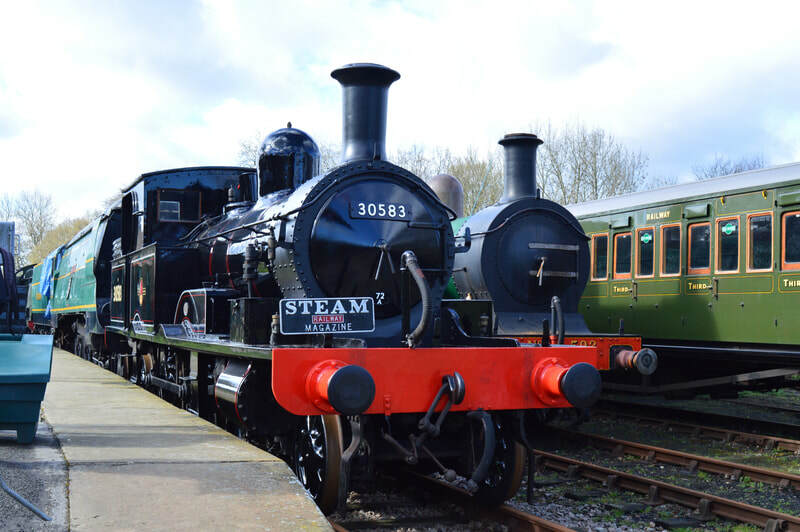 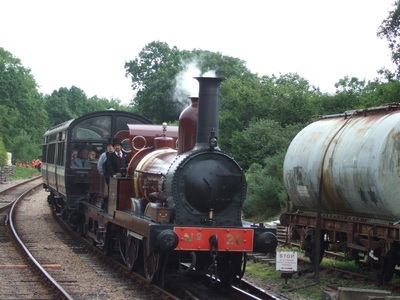 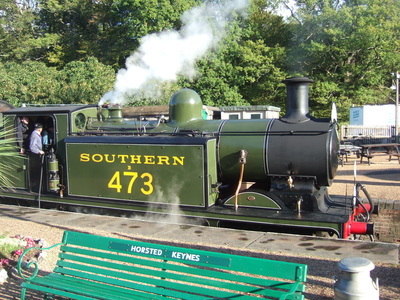 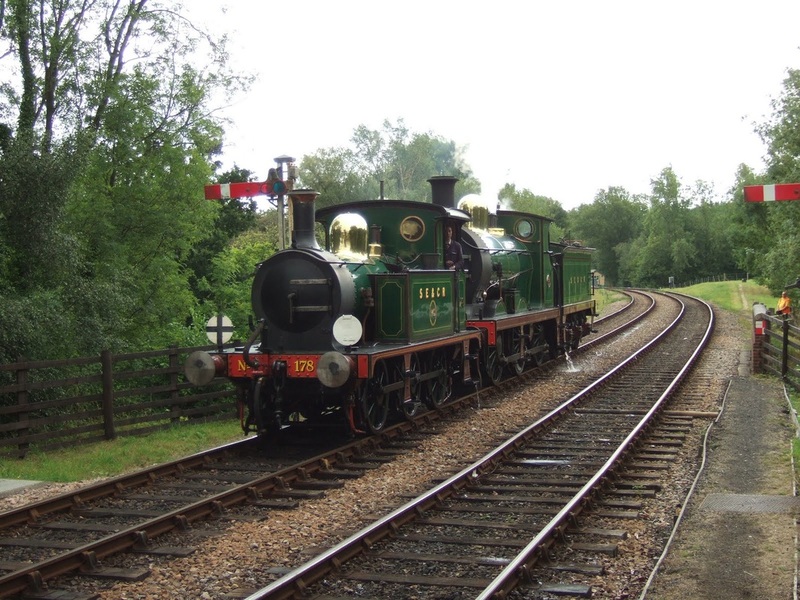 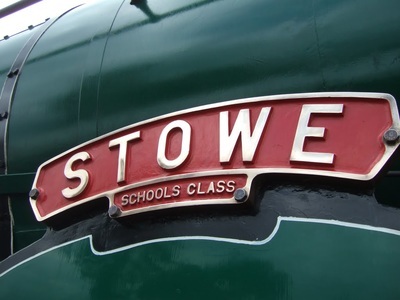 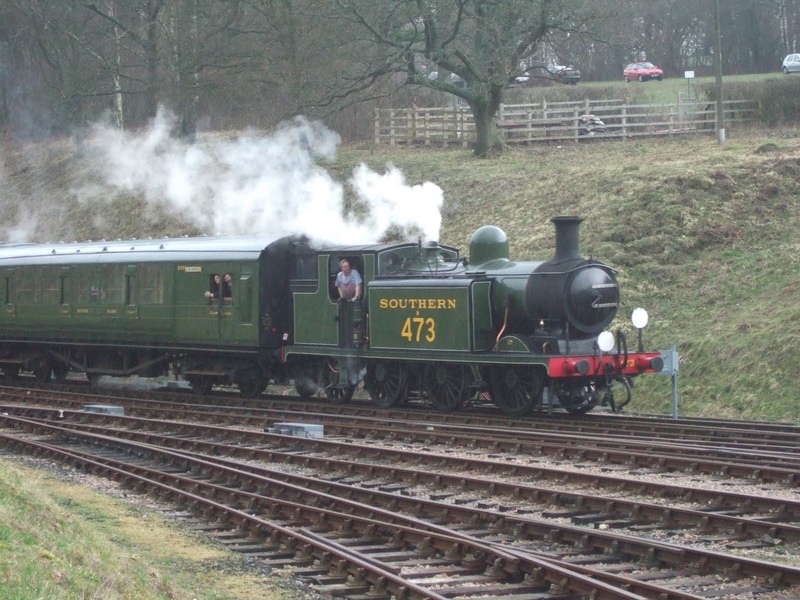 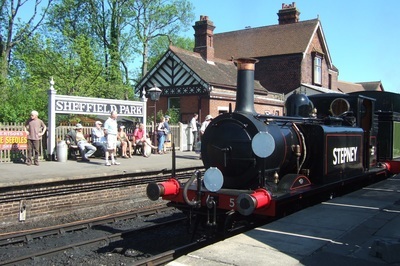 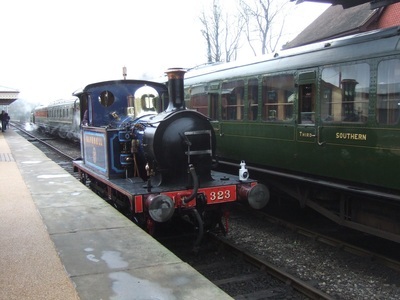 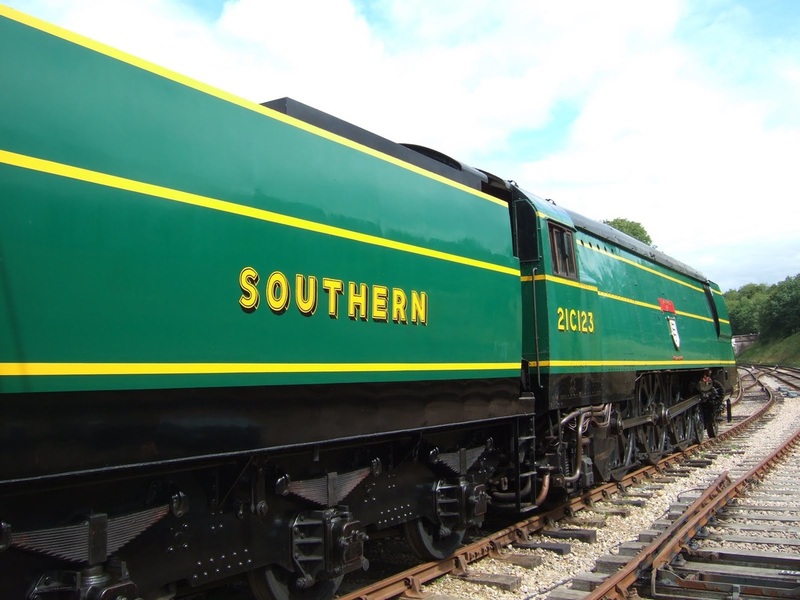 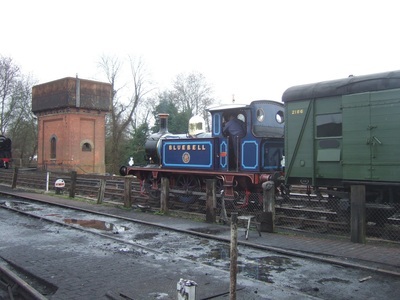 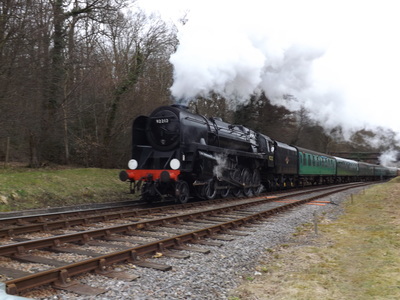 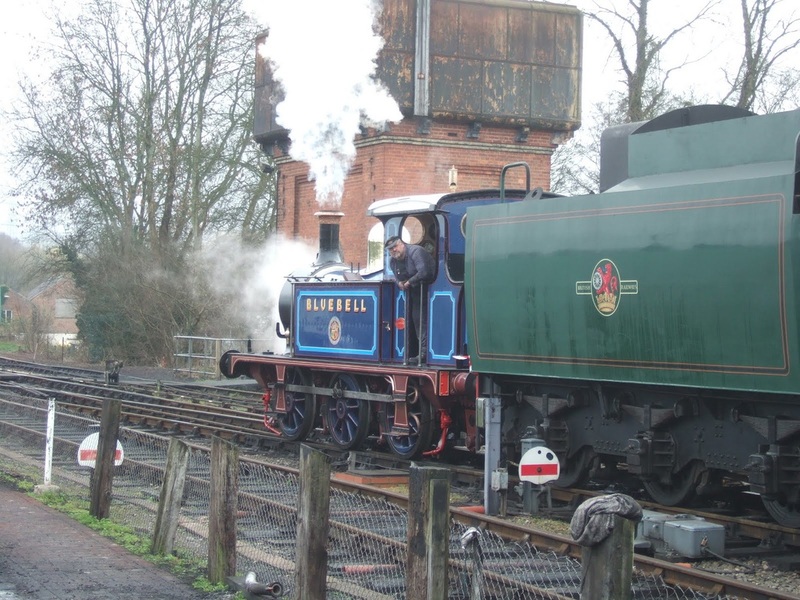 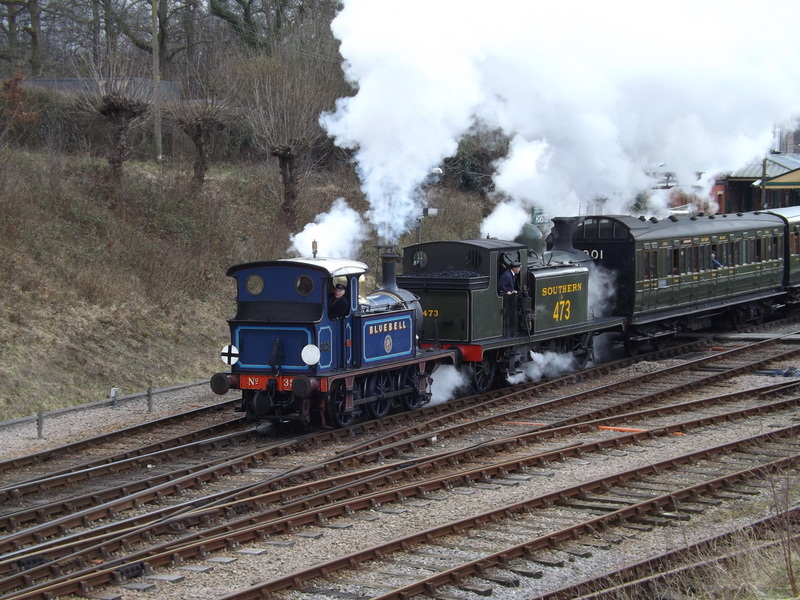 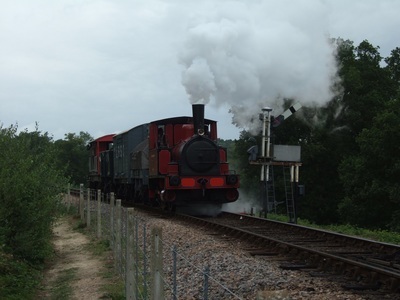 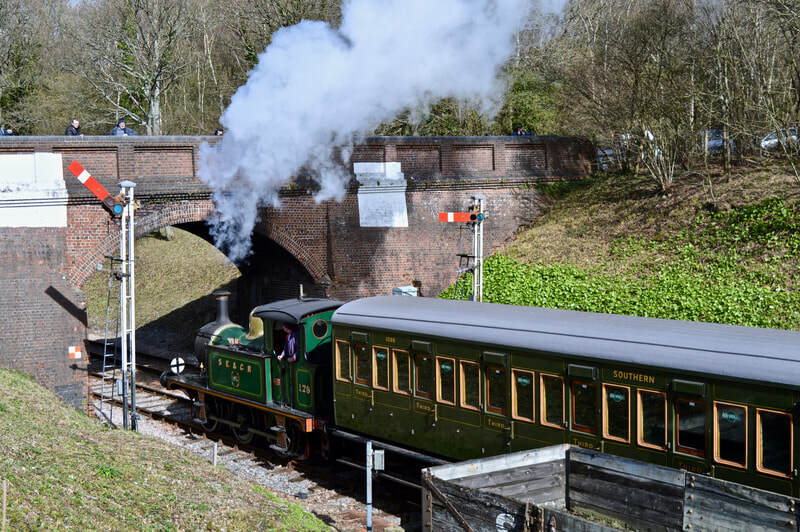 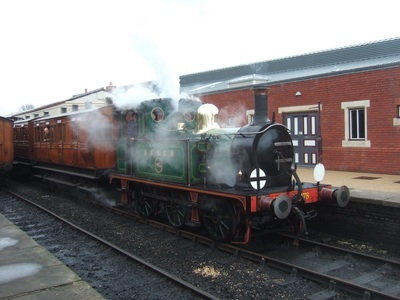 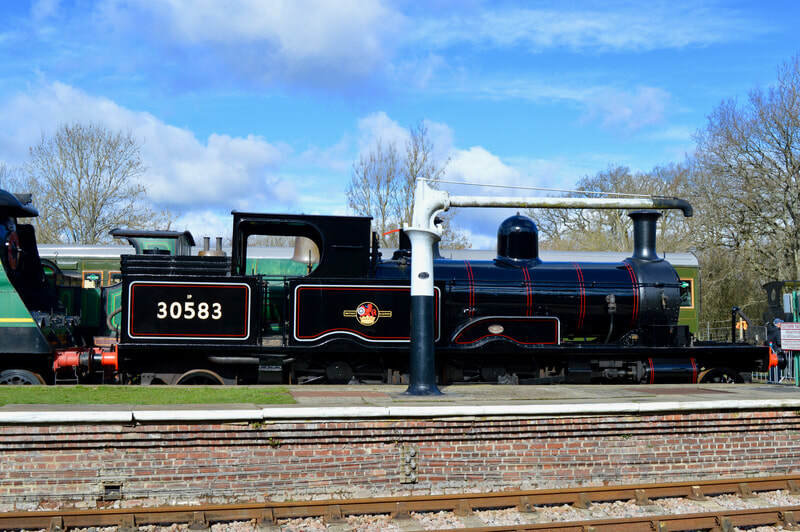 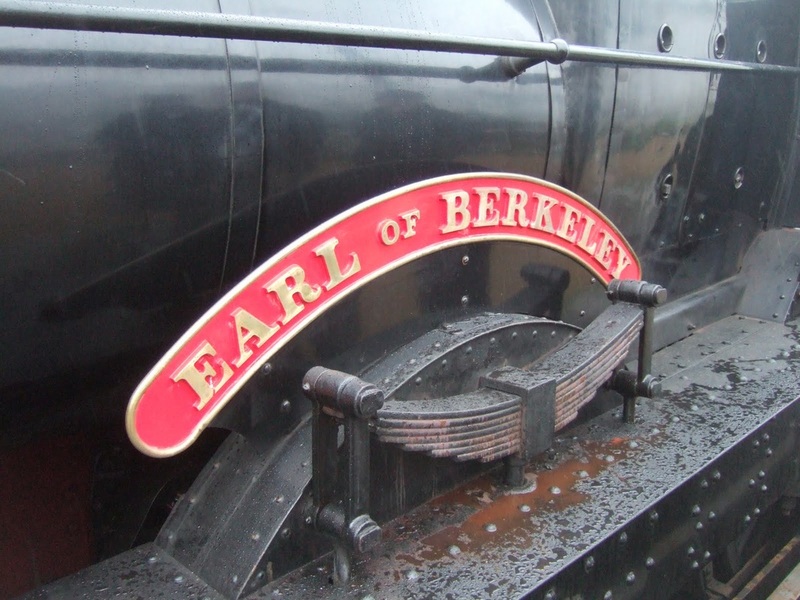 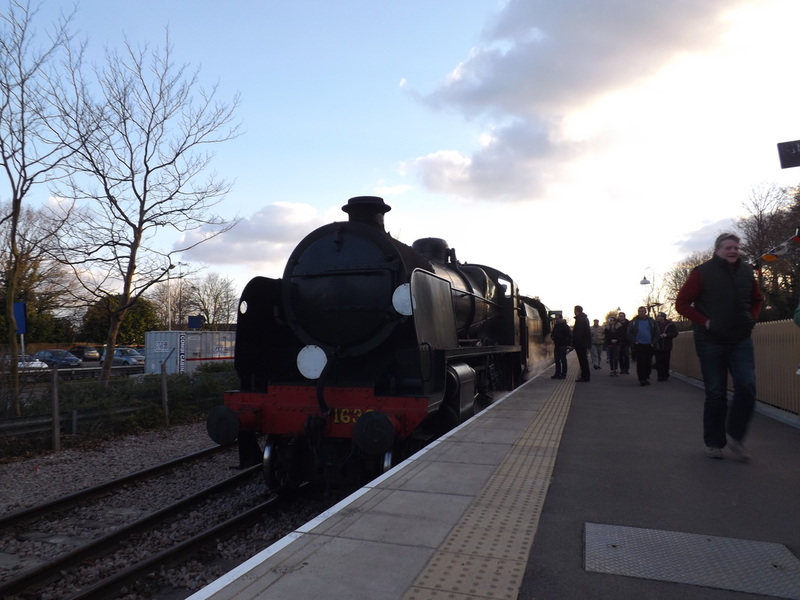 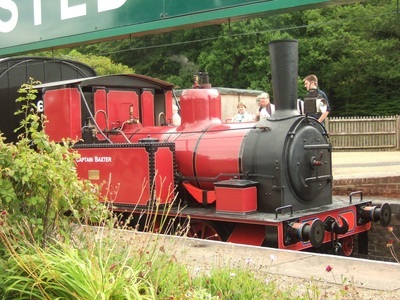 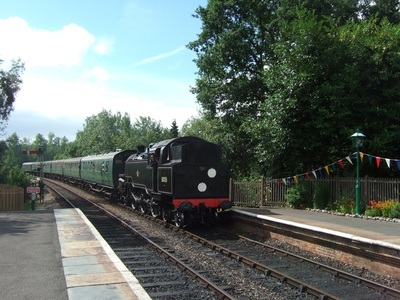 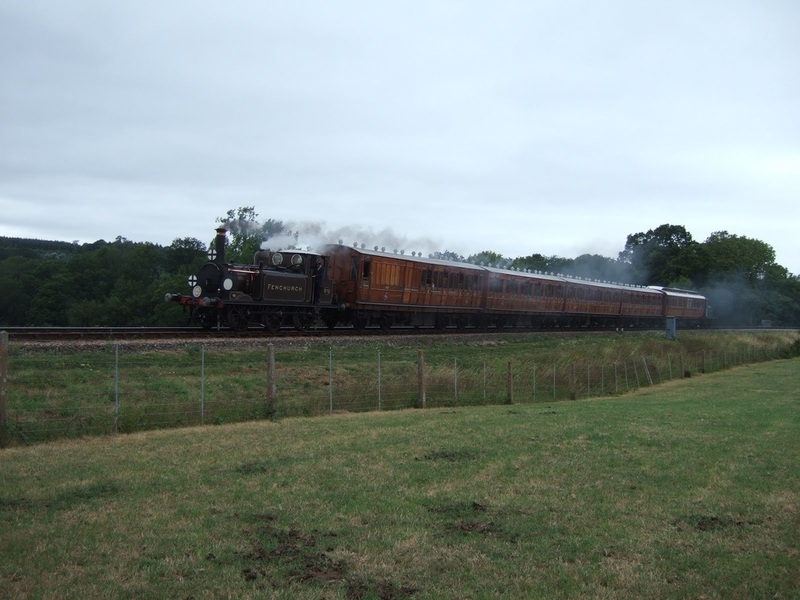 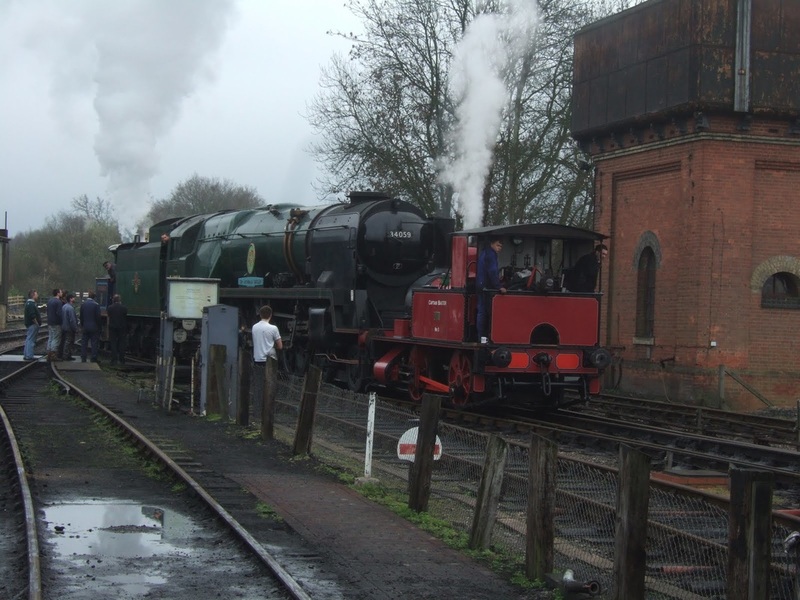 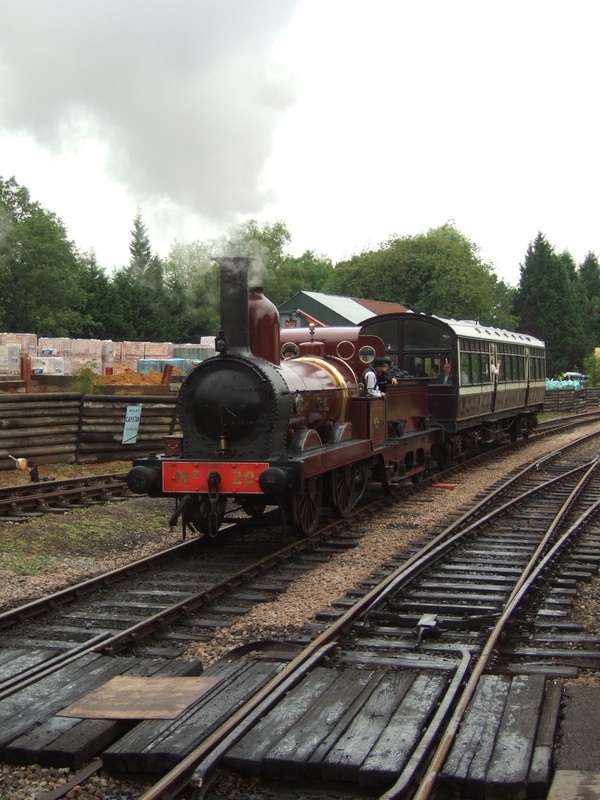 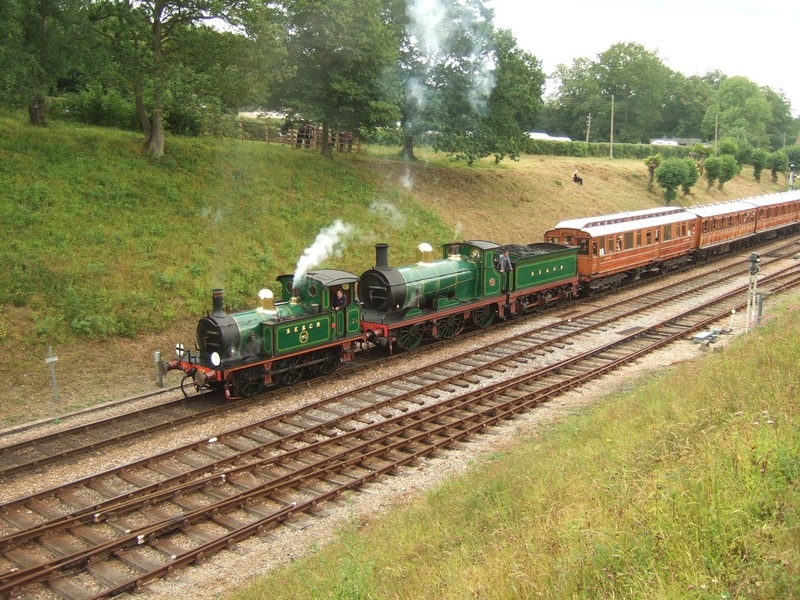 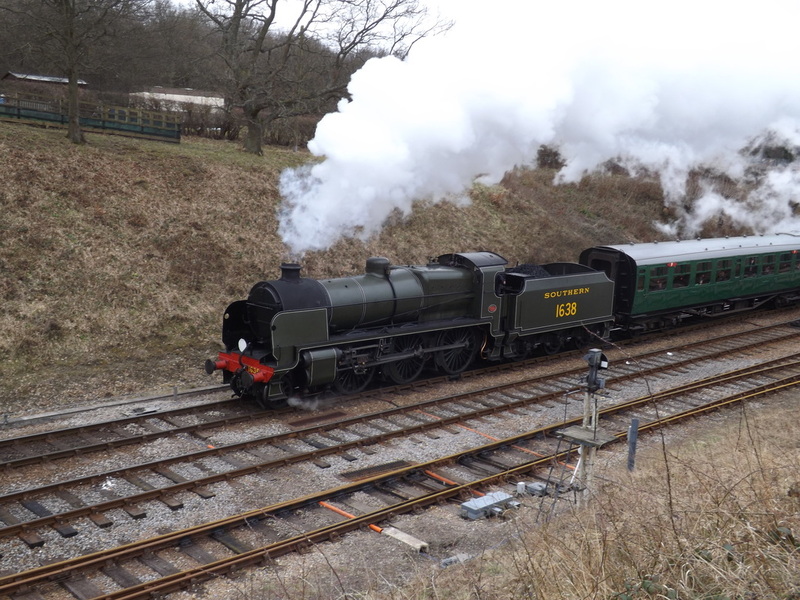 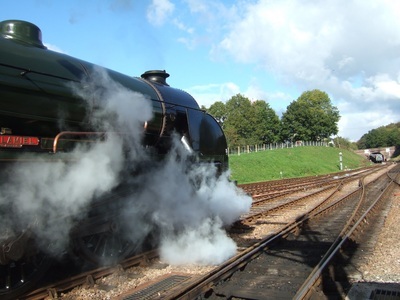 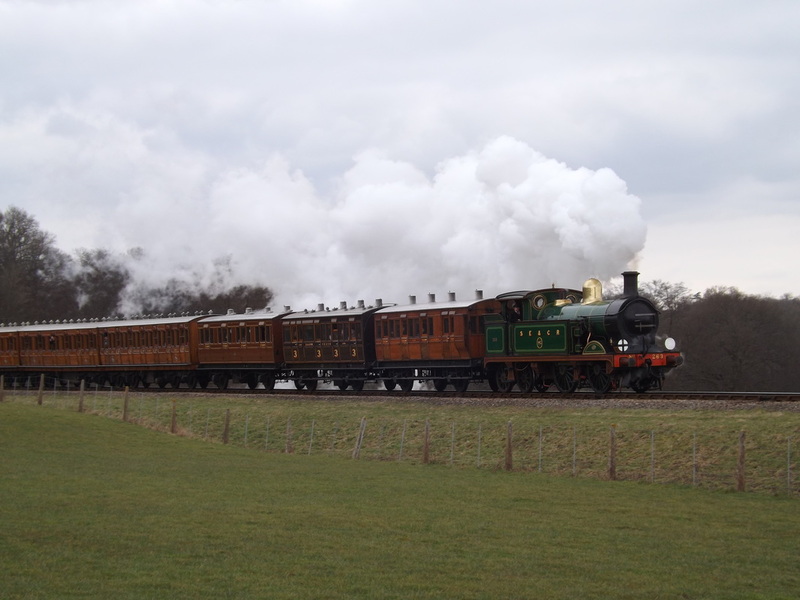 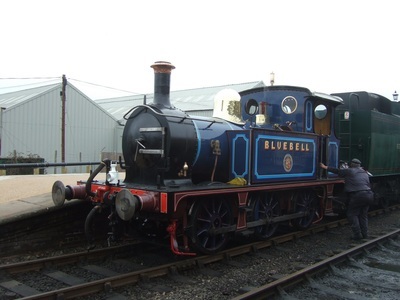 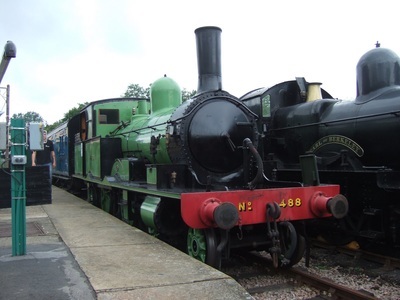 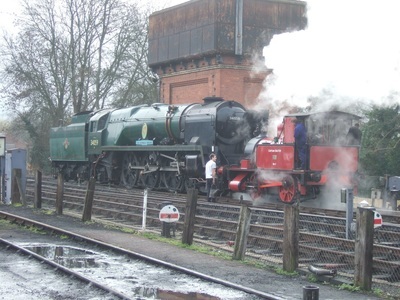 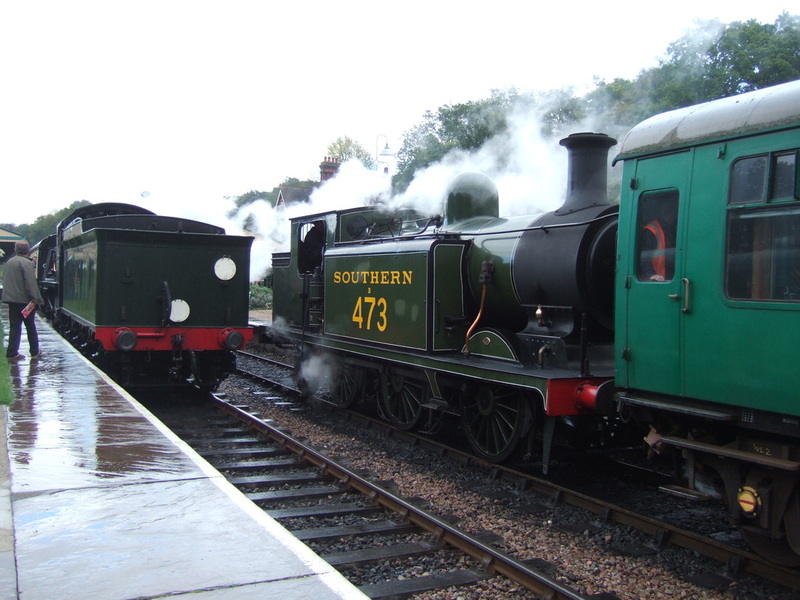 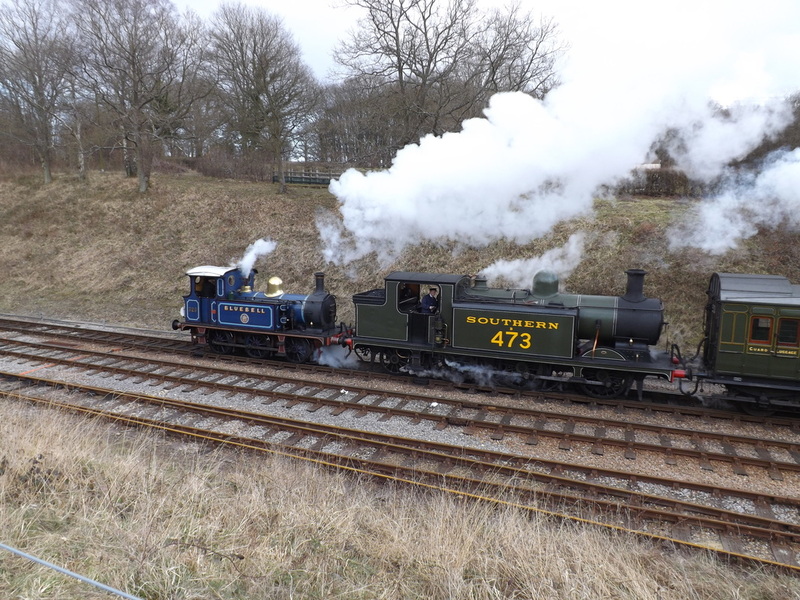 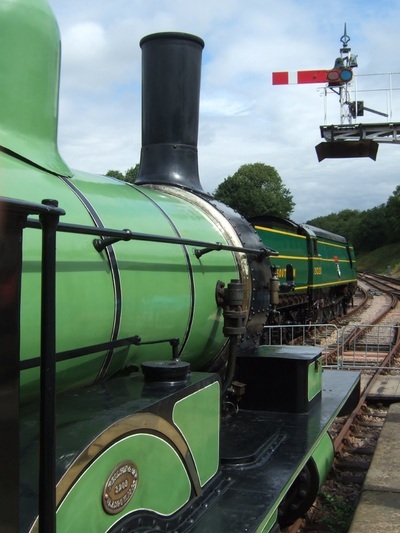 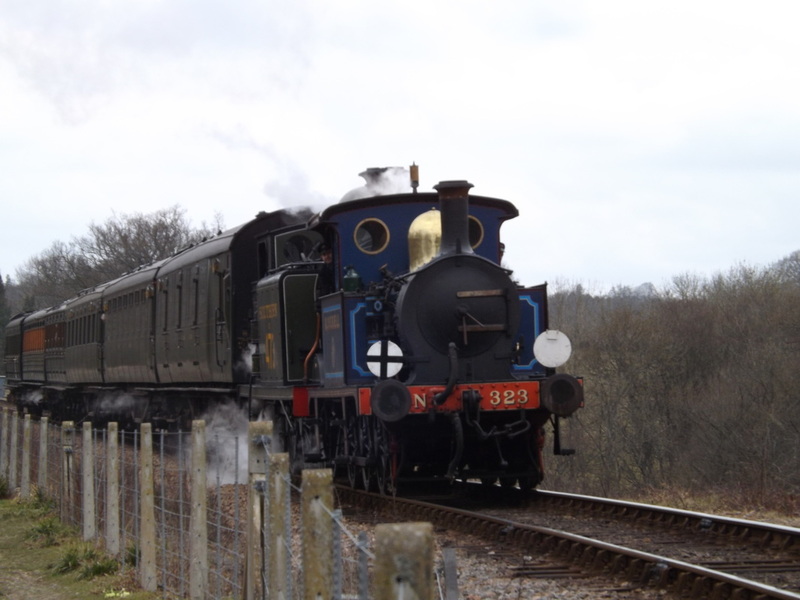 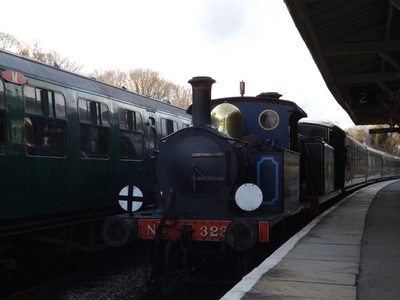 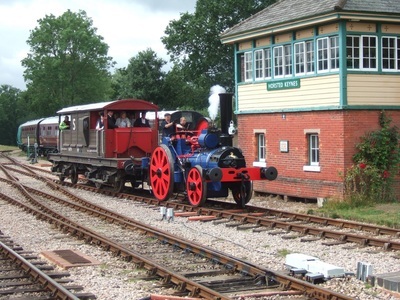 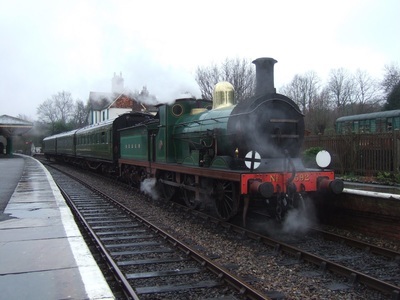 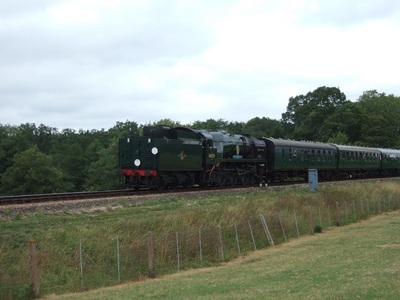 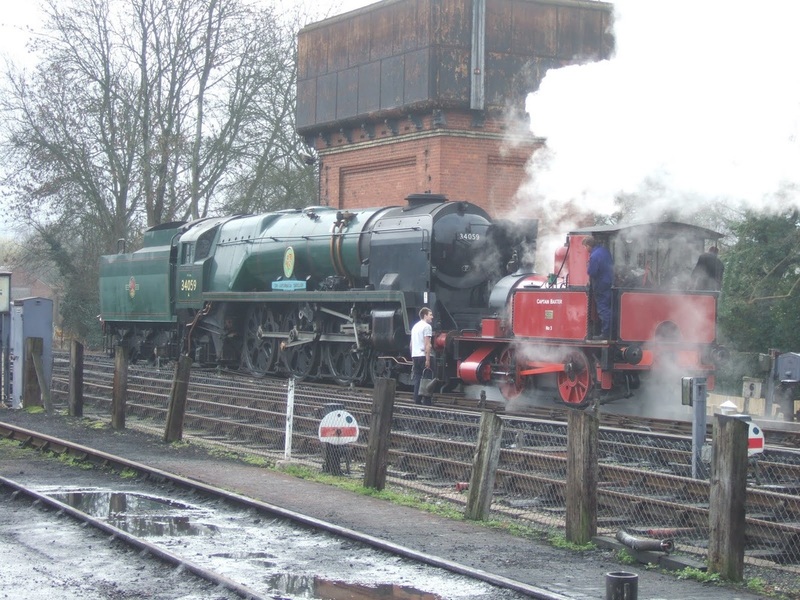 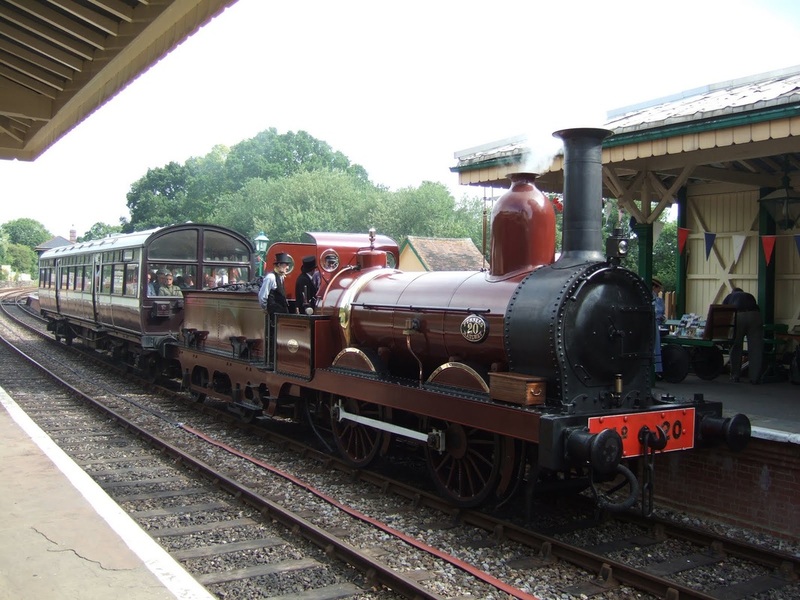 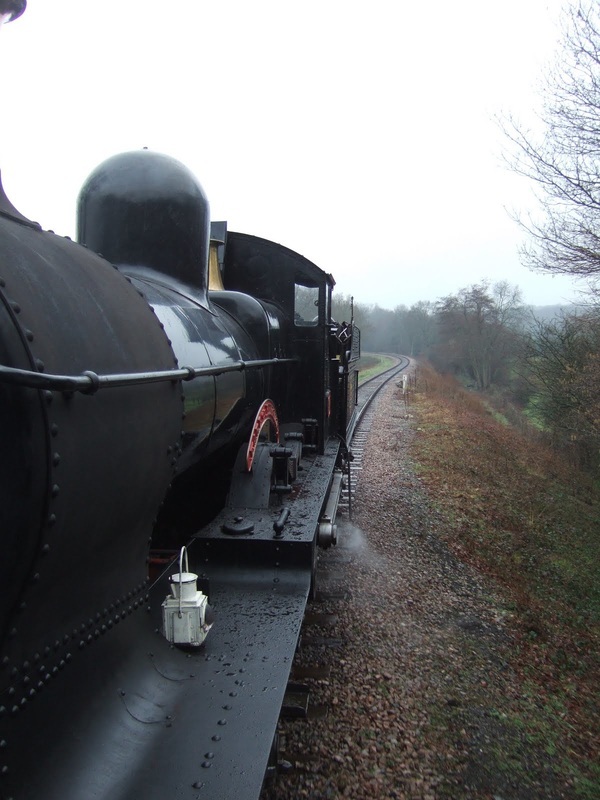 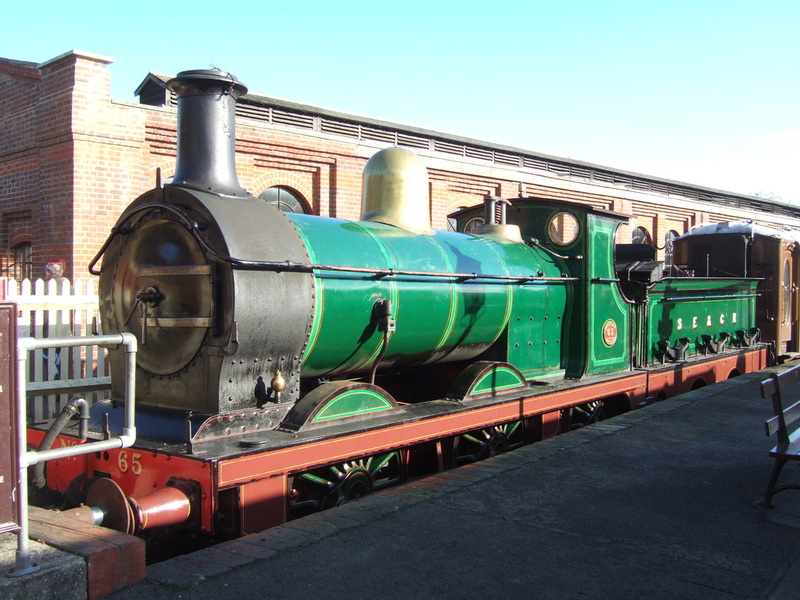 Fifty three years since reopening the Sheffield Park to Horsted Keynes stretch of line as "The Bluebell Railway", the line extended to East Grinstead. A two week festival was run in celebration of the opening, with an intensive timetable and double headed trains. 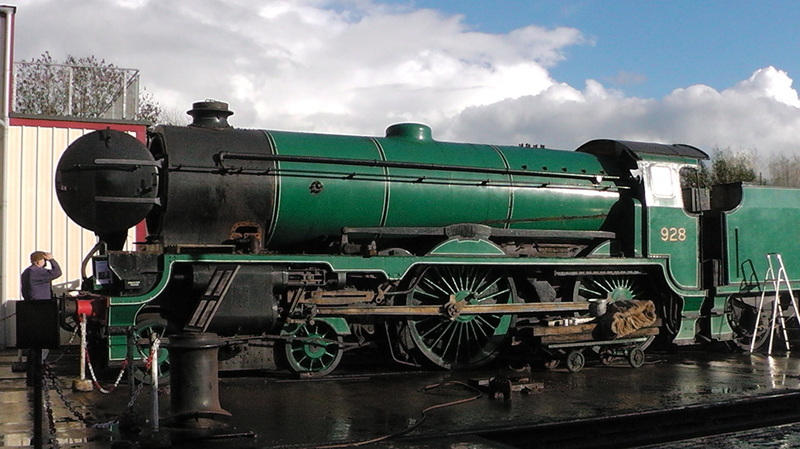 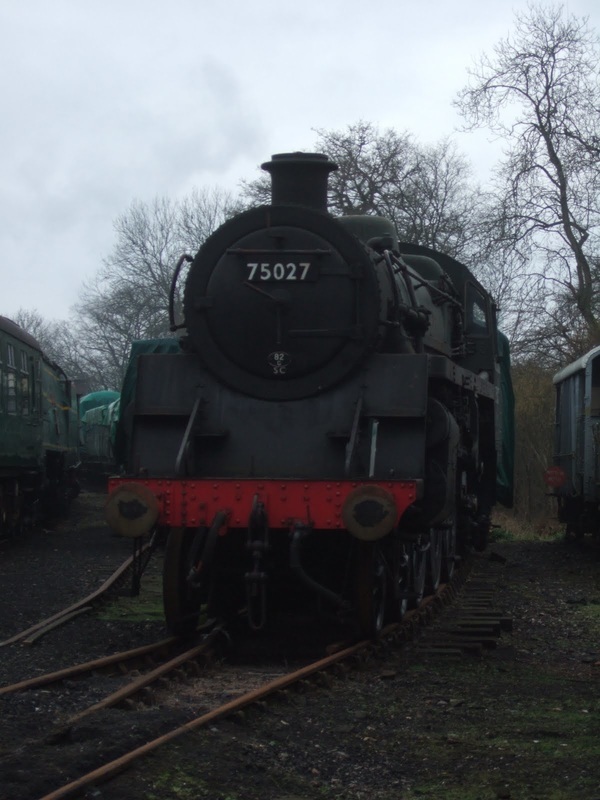 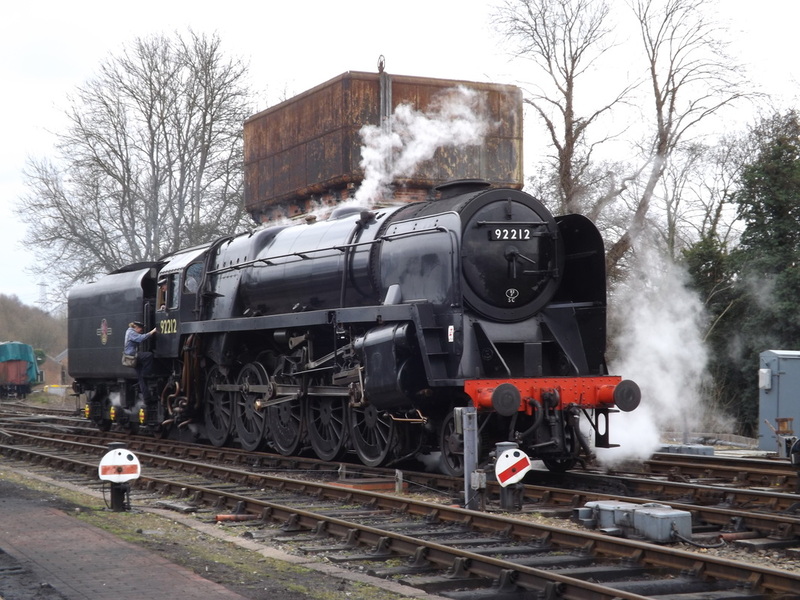 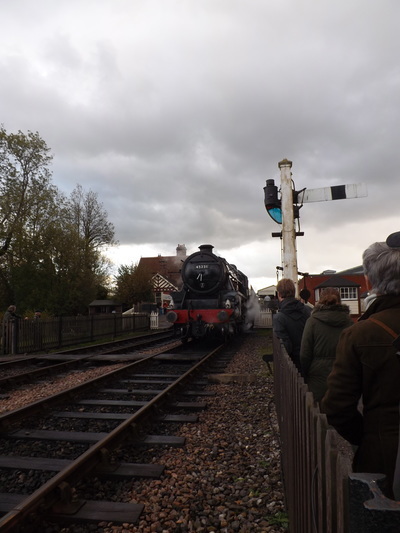 As part of the 50th Anniversary Celebrations, 30777 Sir Lamiel visited for a spell during the Autumn, including staring in the Giants of Steam event. 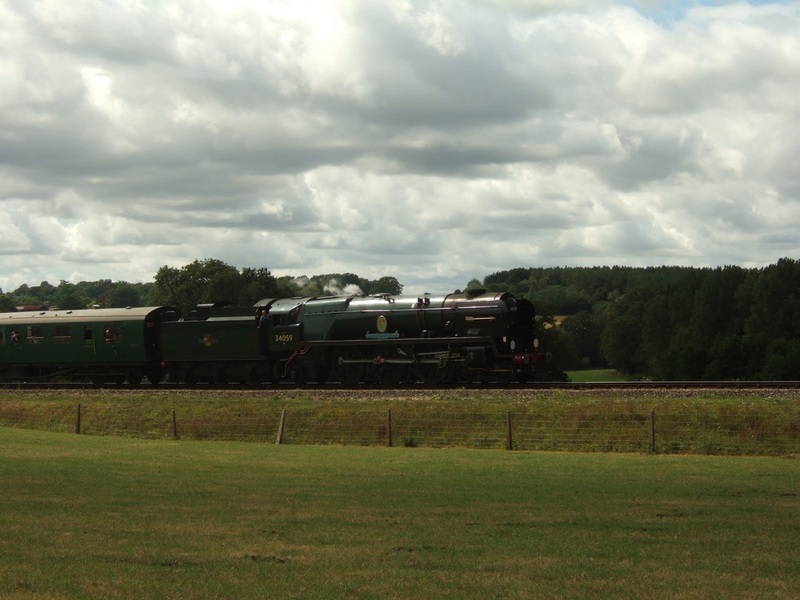 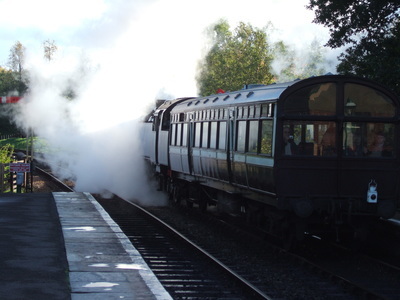 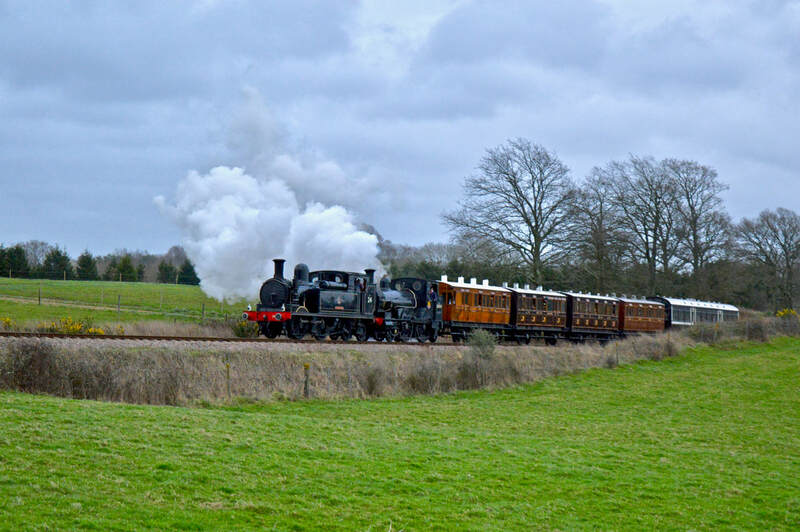 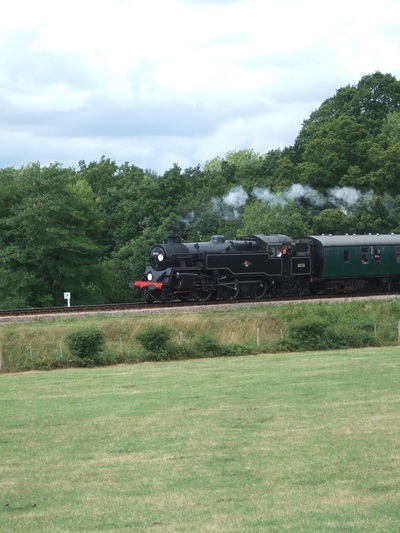 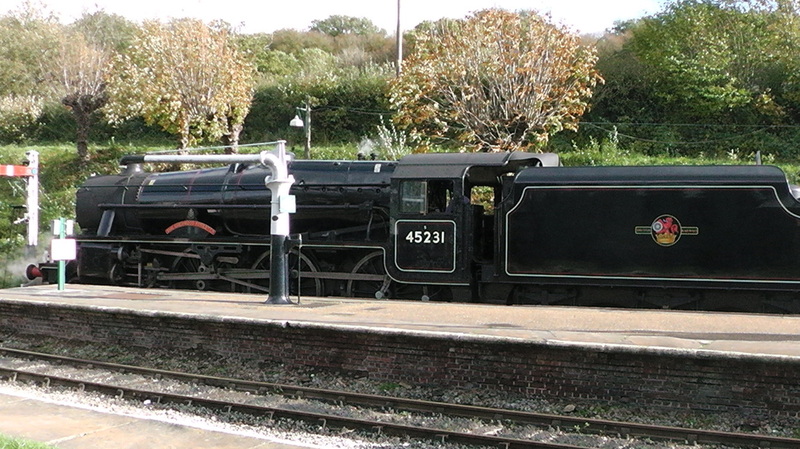 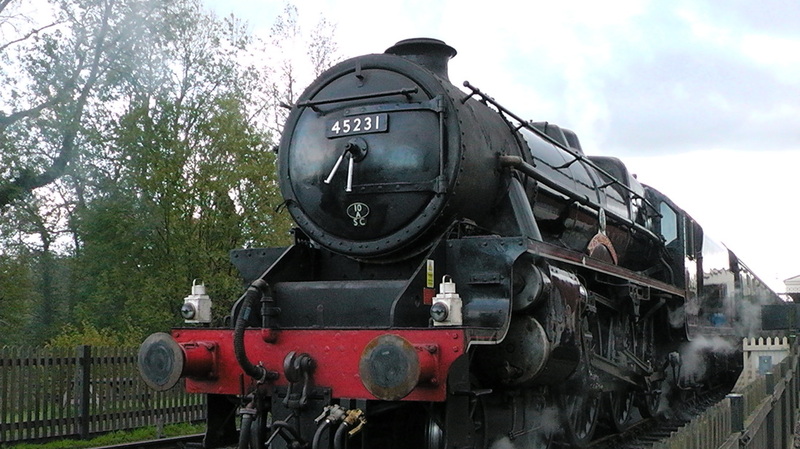 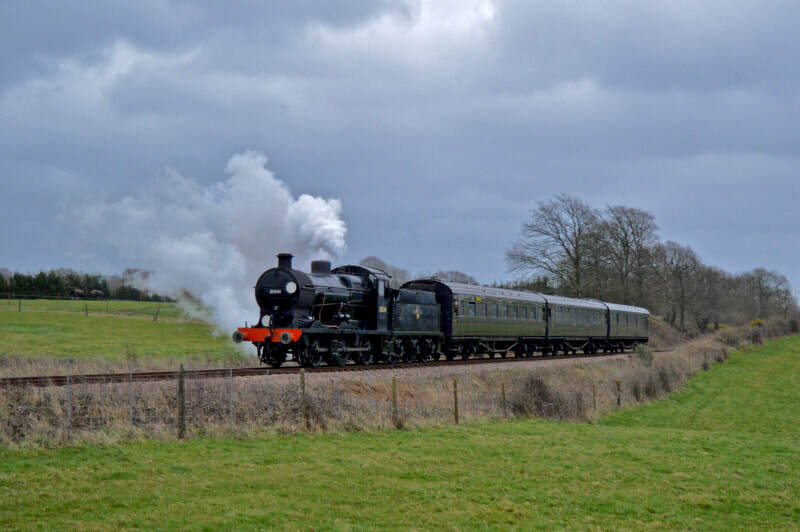 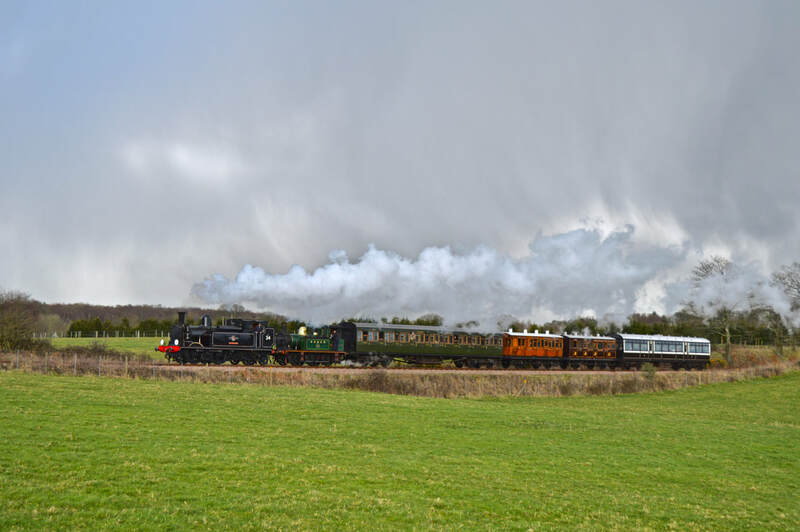 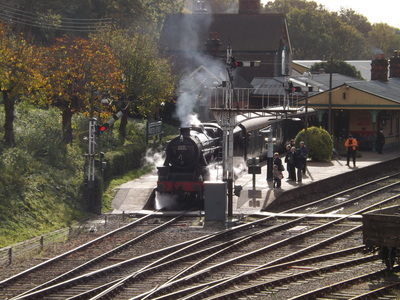 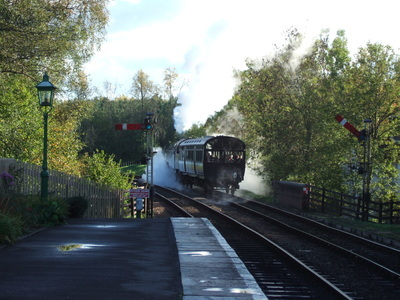 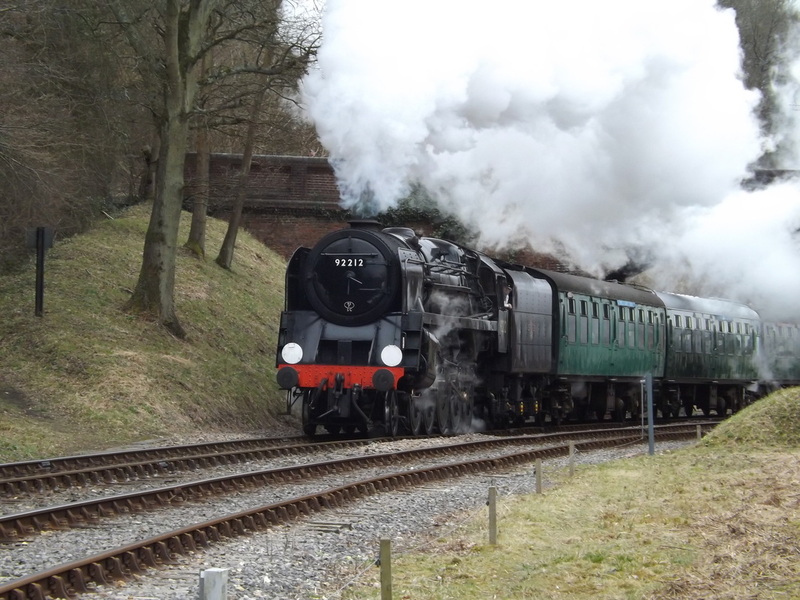 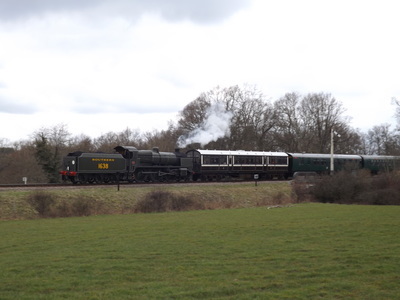 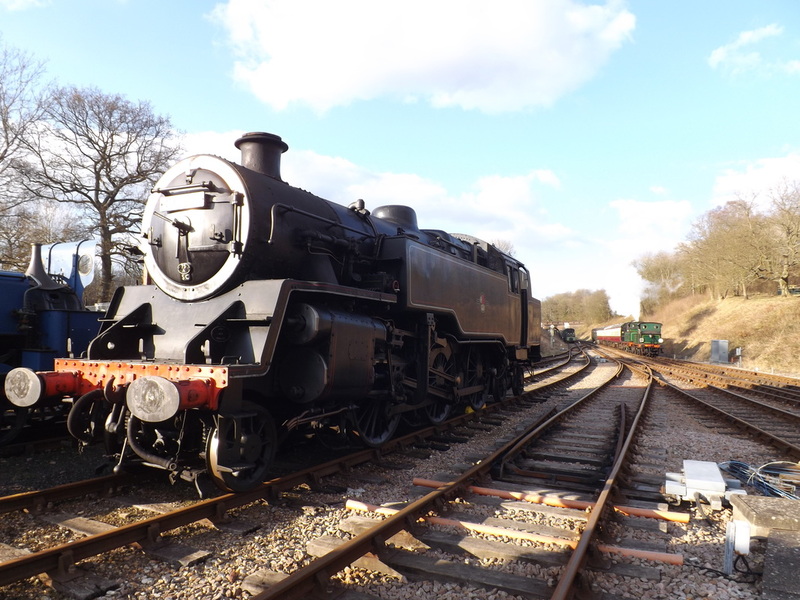 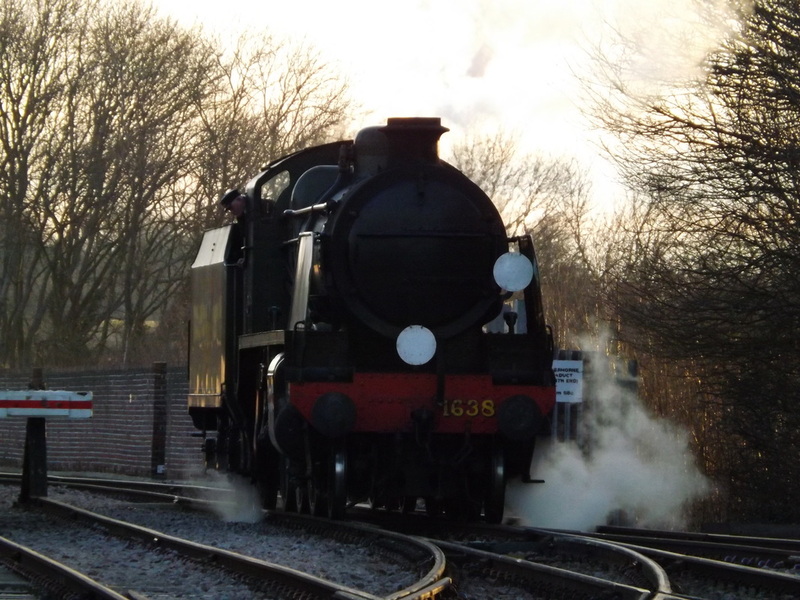 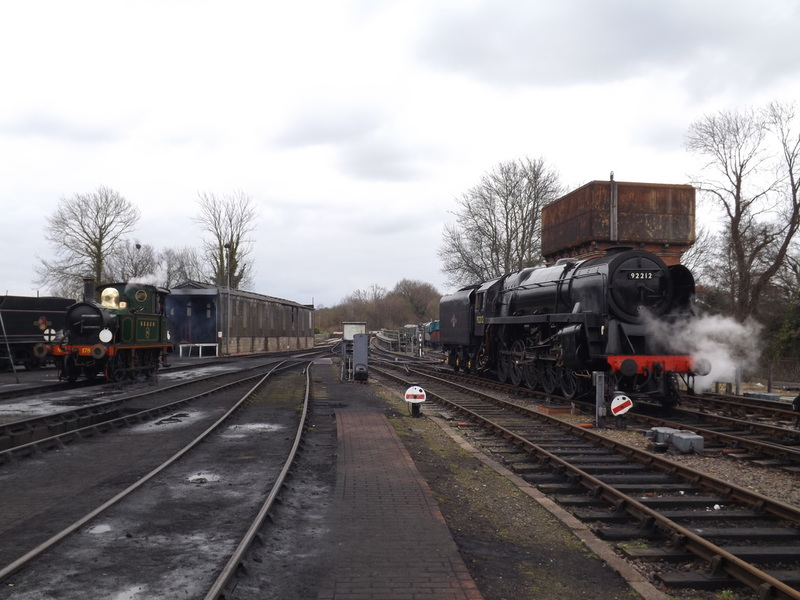 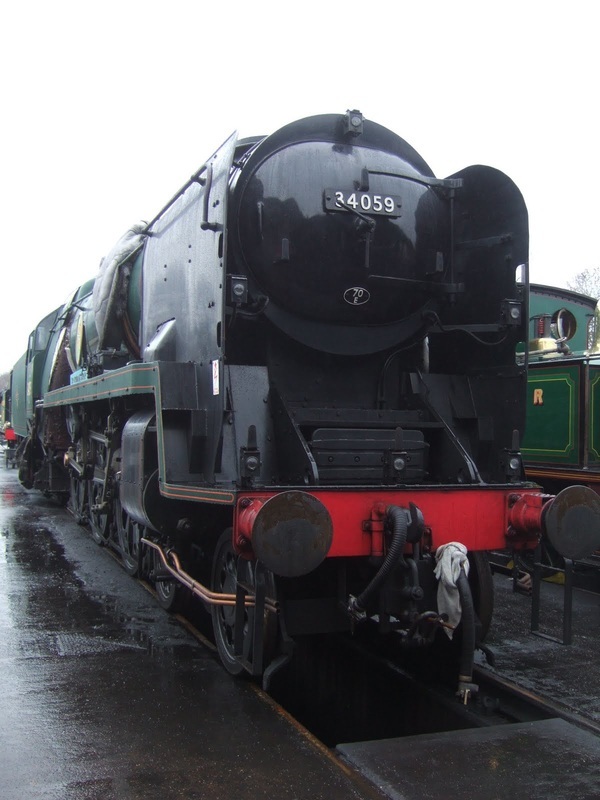 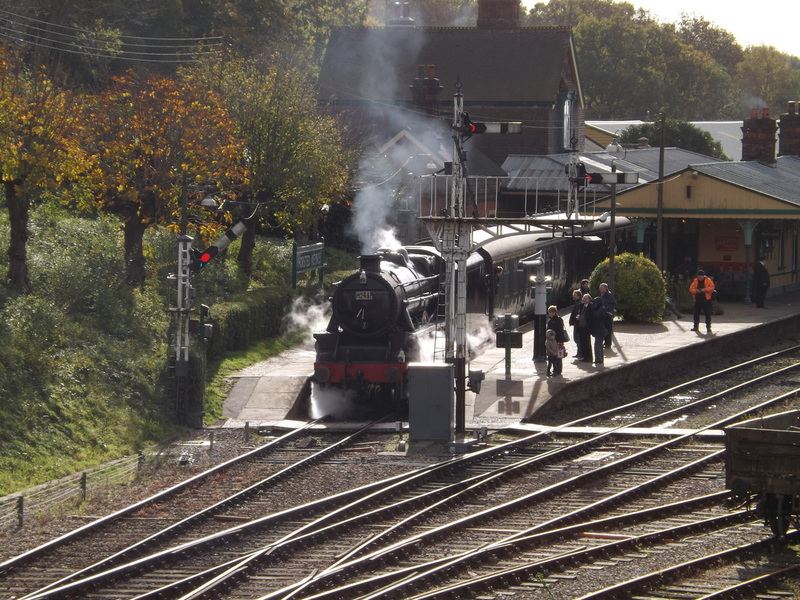 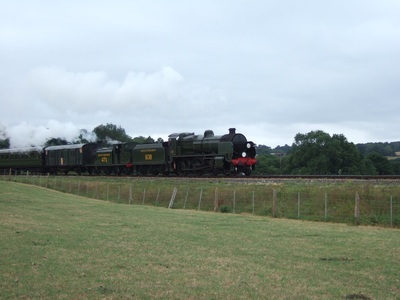 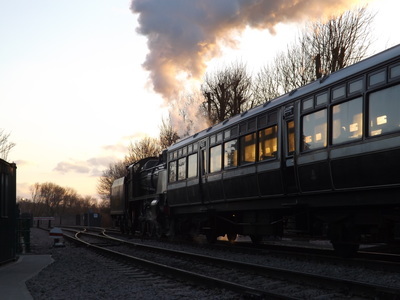 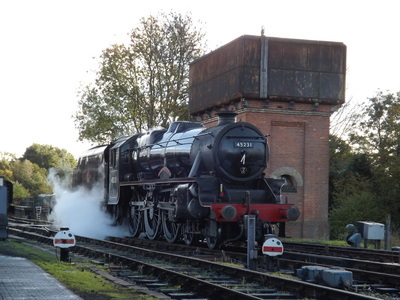 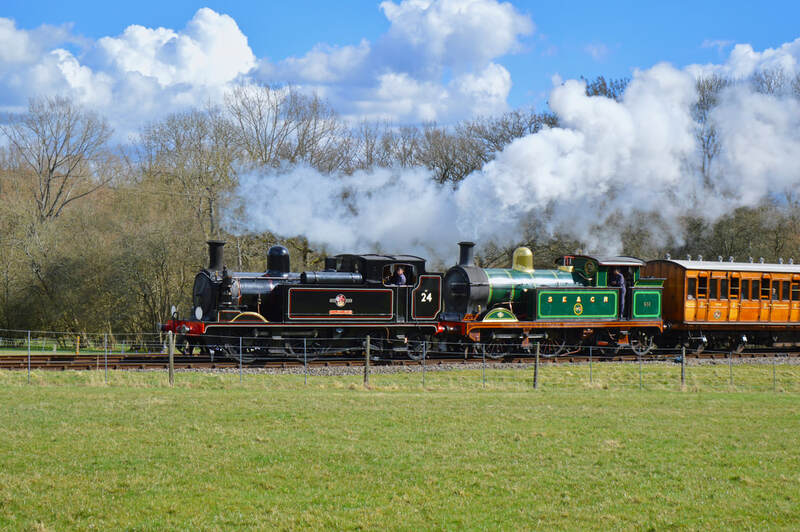 I captured Sir Lamiel during her visit on a running day with the E4 and Standard 4MT also in operation. 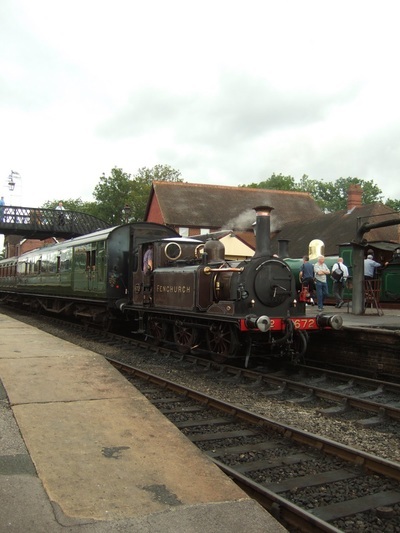 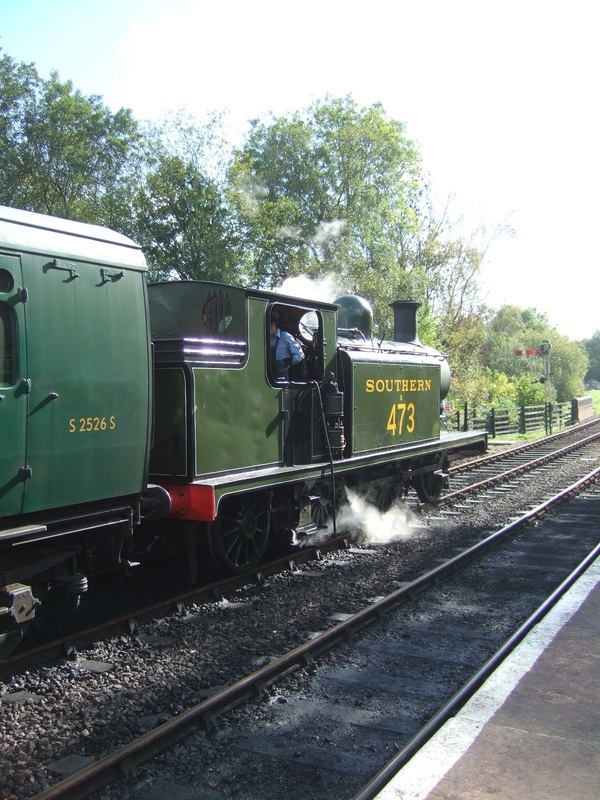 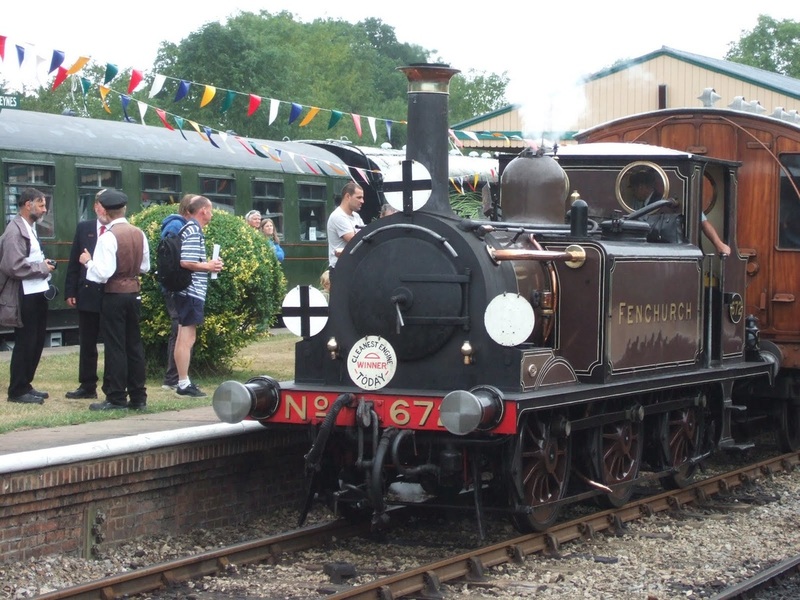 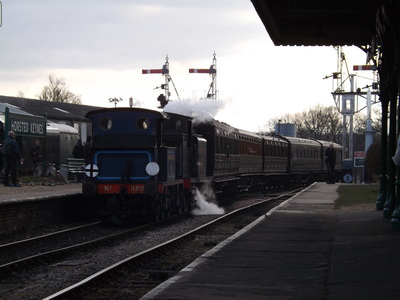 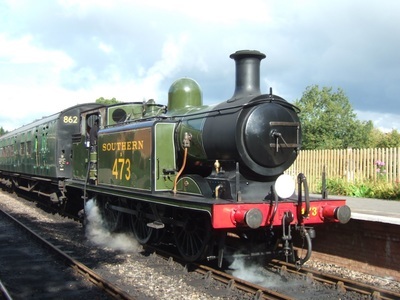 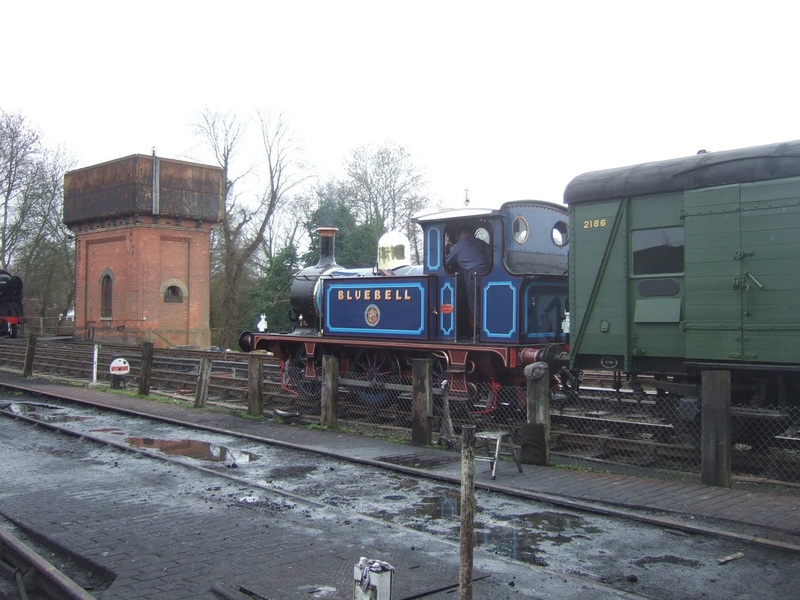 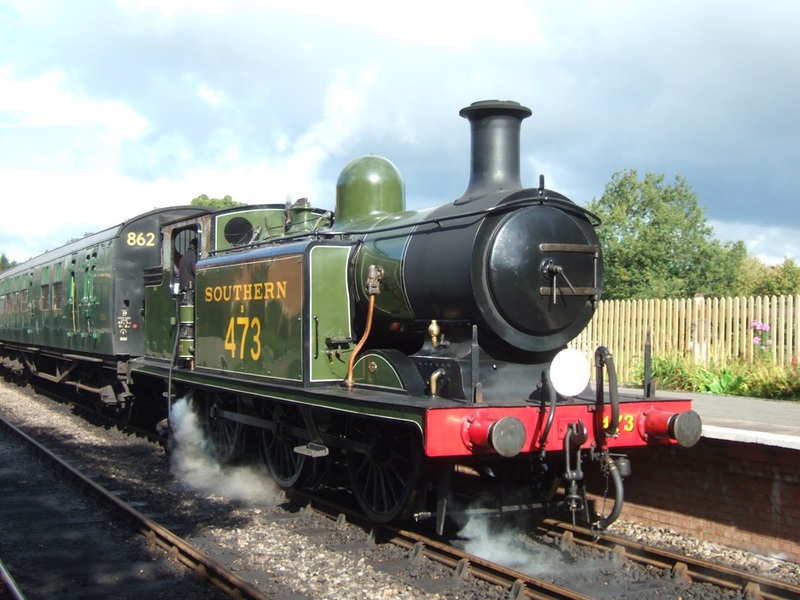 The Bluebell Railway reopened on 7th August 1960, when Terrier 55 Stepney and P Class 323 Bluebell ran from Sheffield Park to Bluebell Halt (just outside of Horsted Keynes). 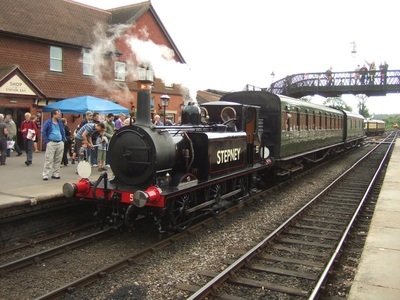 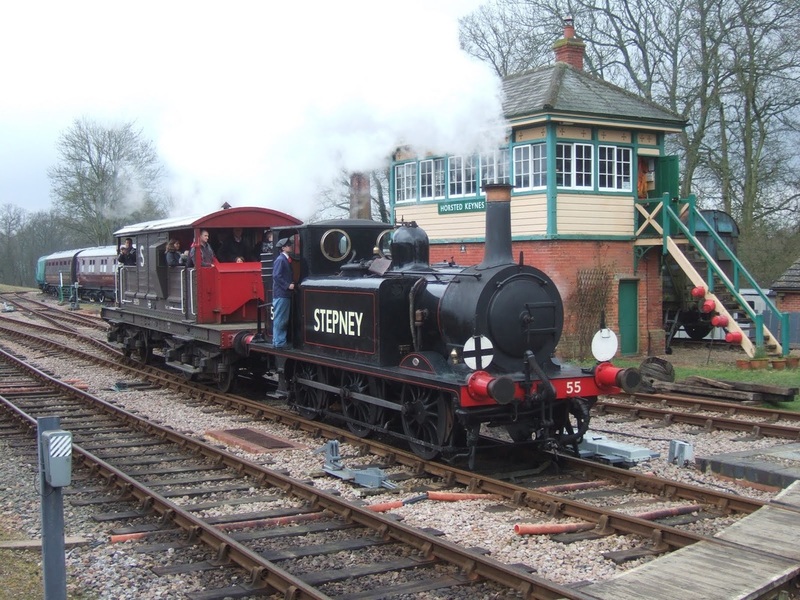 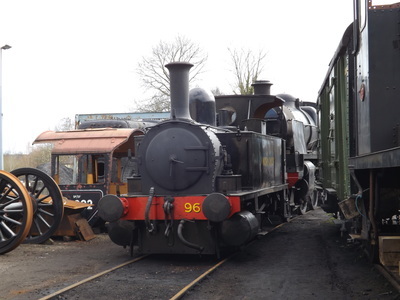 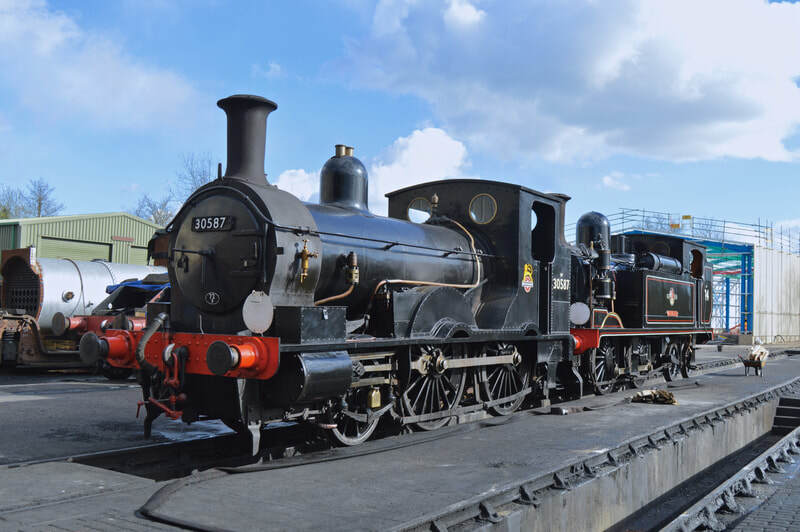 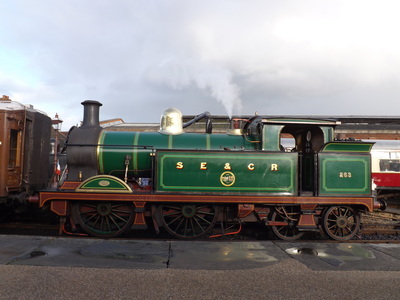 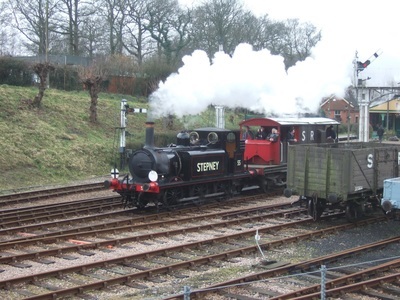 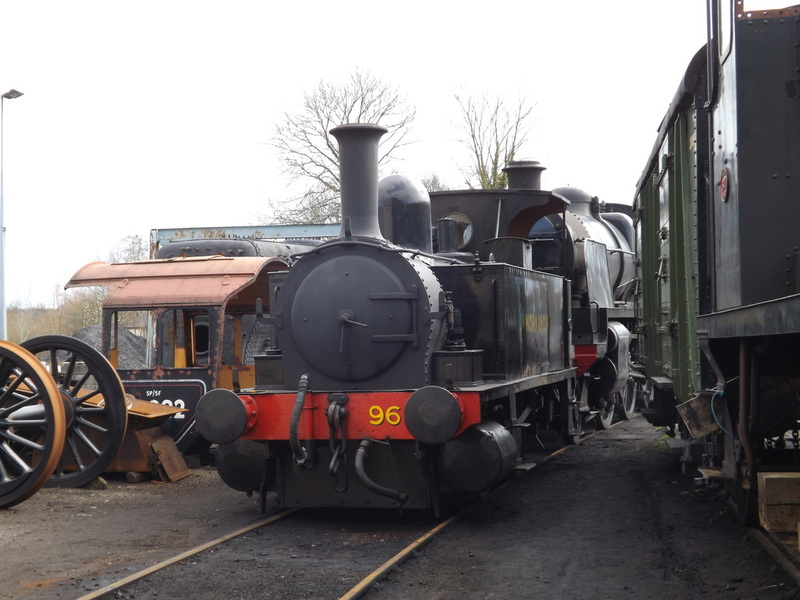 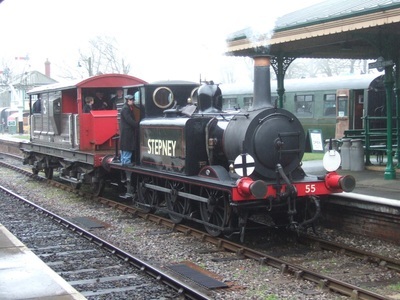 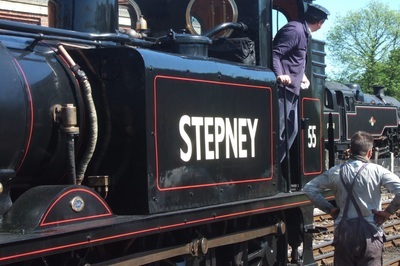 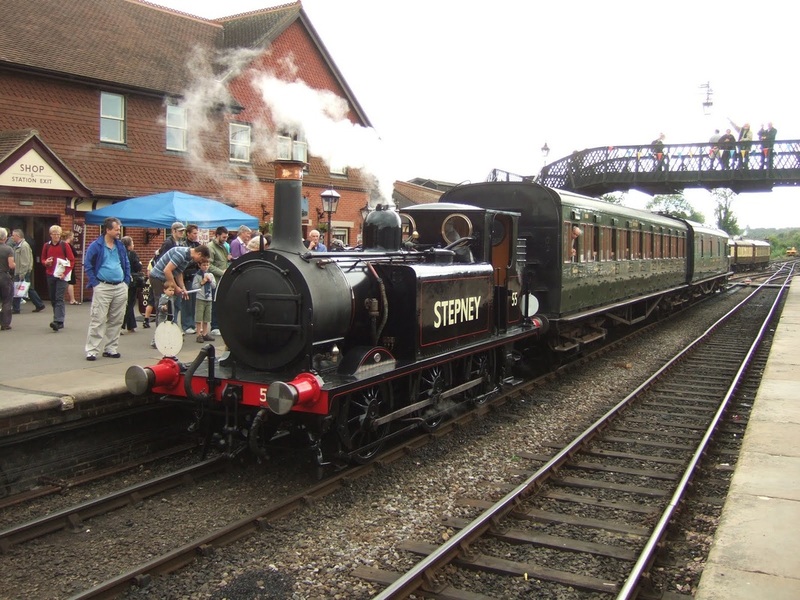 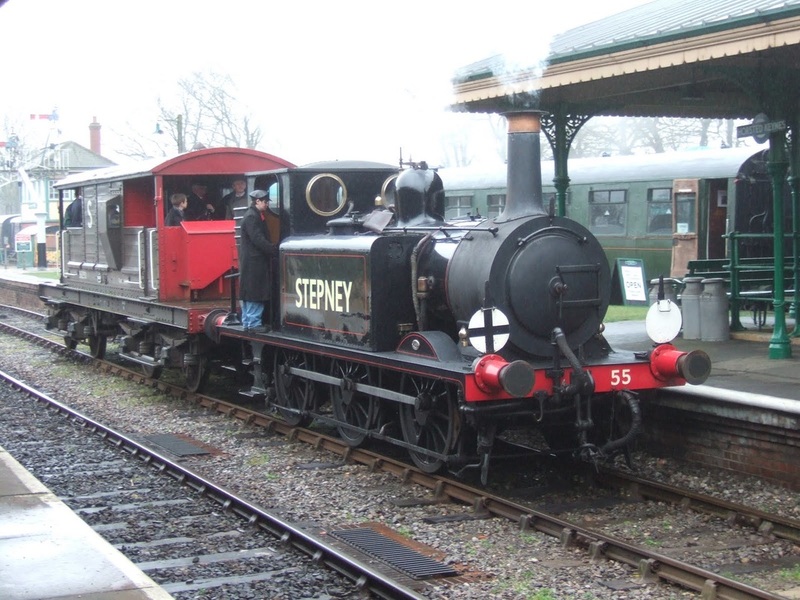 50 years later a celebration was held on the Bluebell Railway, with Stepney, carrying her 1960 lined black, the star of the show recreating the original passenger trains. 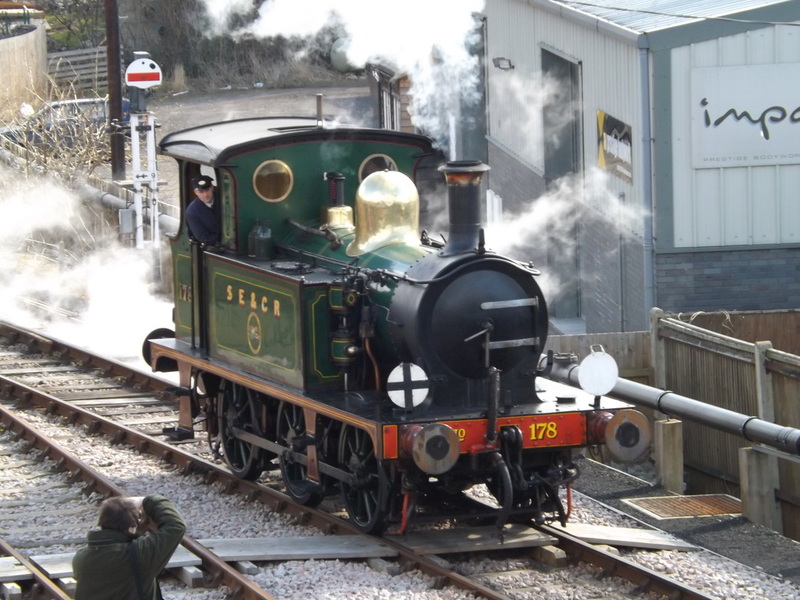 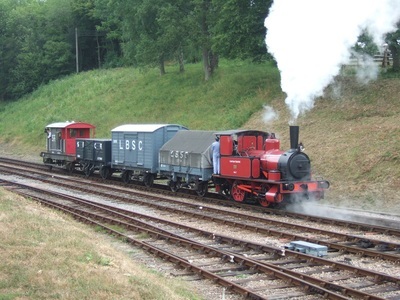 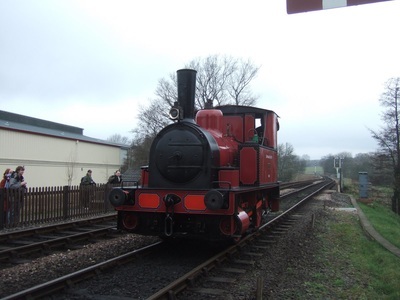 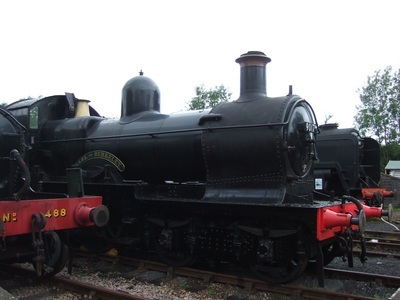 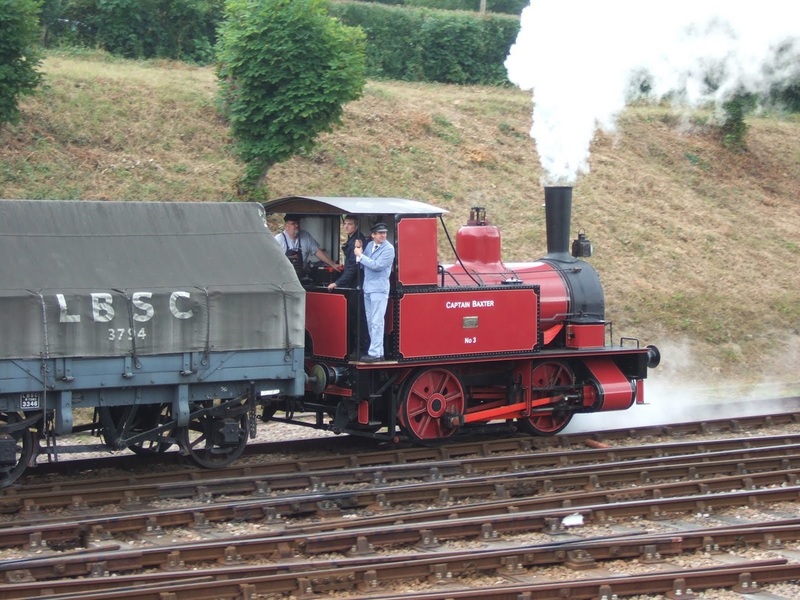 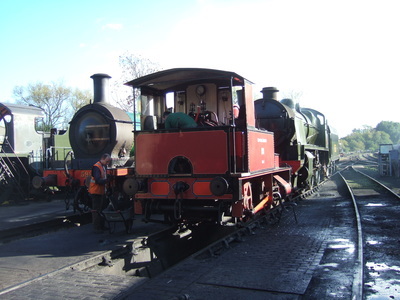 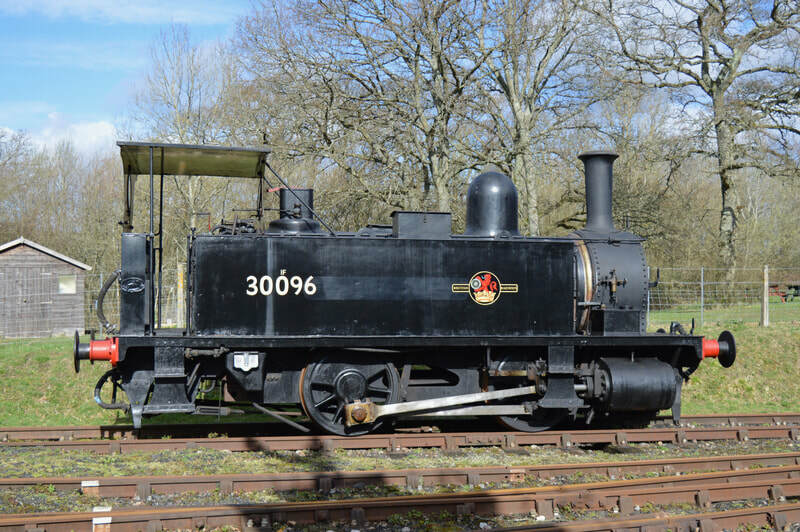 323 was still under overhaul at the time of the gala, leaving Terrier Fenchurch to take her place on re-runs of the original trains. The three day events saw an intensive timetable with attractions up and down the line including Baxter shunting at Horsted Keynes, Blue Circle visiting and operating brake van rides on the Ardingly spur, a 15inch gauge Romney Hythe and Dymchurch Railway locomotive on a short demonstration line at Horsted Keynes, Furness 20 operating shuttles from Kingscote to Imberhorne cutting and locomotives usually kept undercover at Sheffield Park displayed in the sunshine at Horsted Keynes. 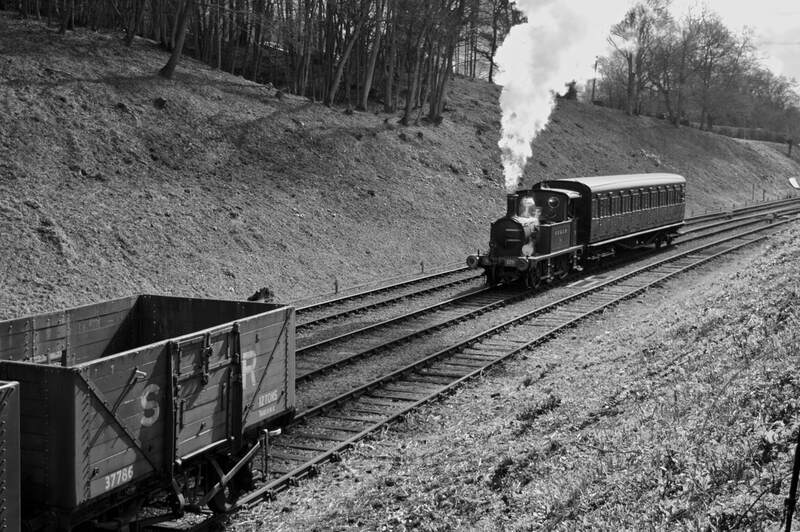 In 1960 steam, still remained supreme on the main line, but many back waters had already closed even before Doctor Beeching's cuts. 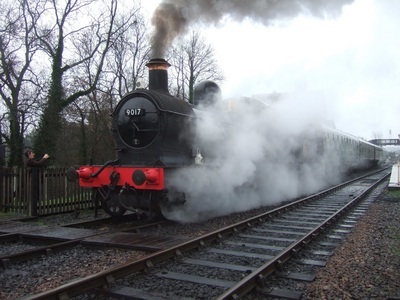 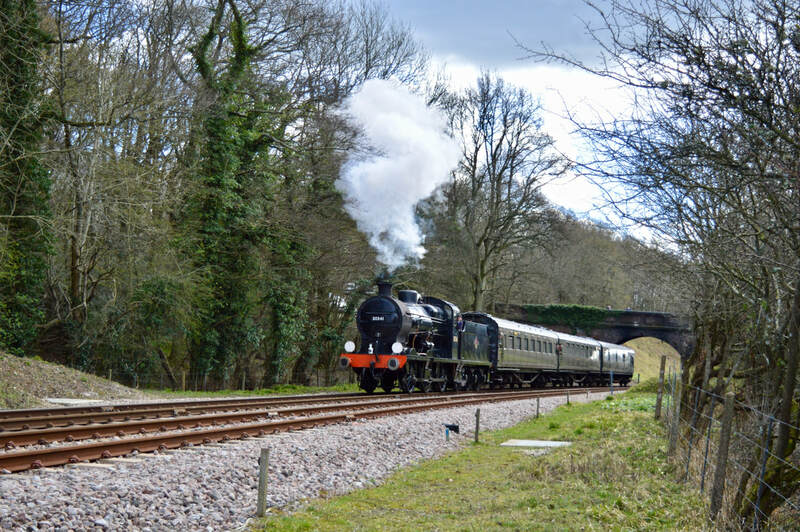 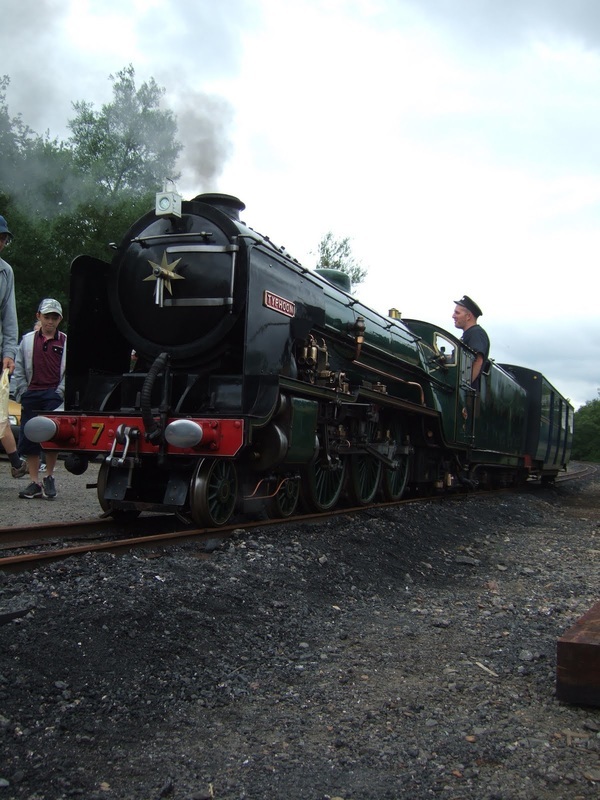 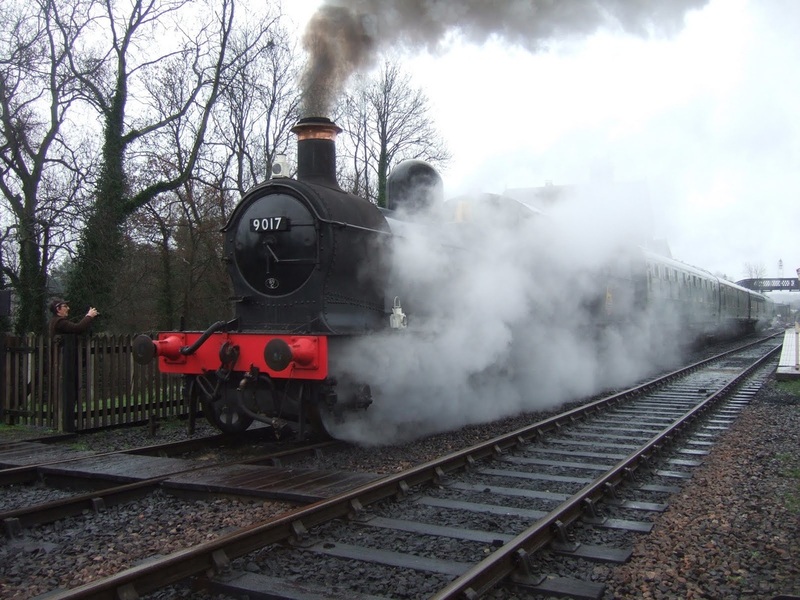 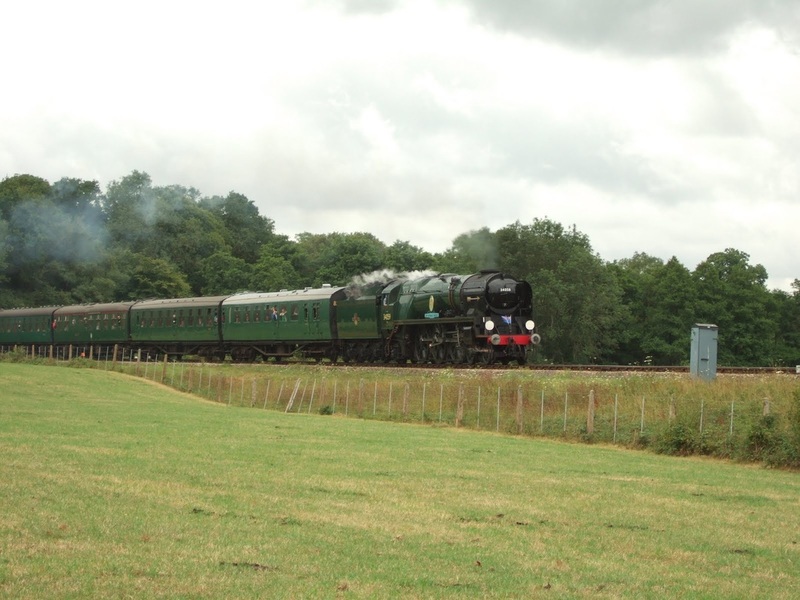 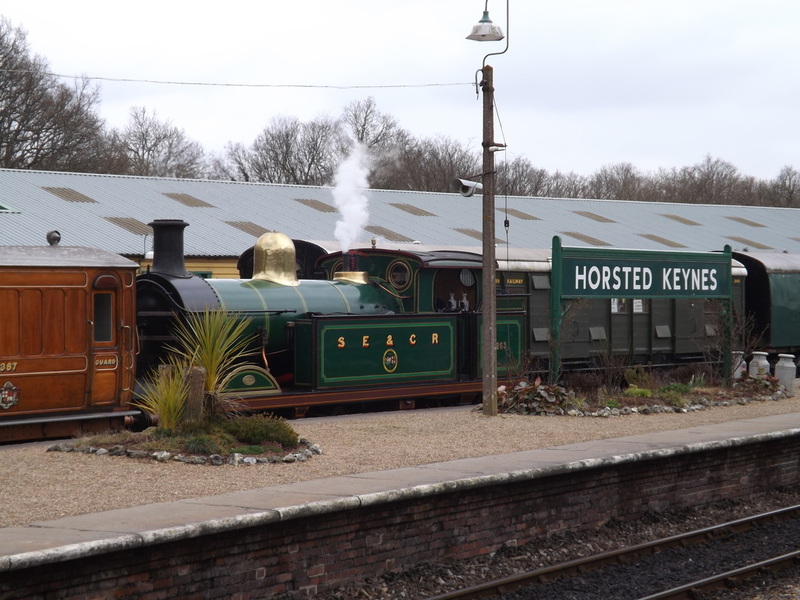 Enthusiasts and locals fought for the railway and in 1960 the line from Sheffield Park to just outside of Horsted Keynes reopened. 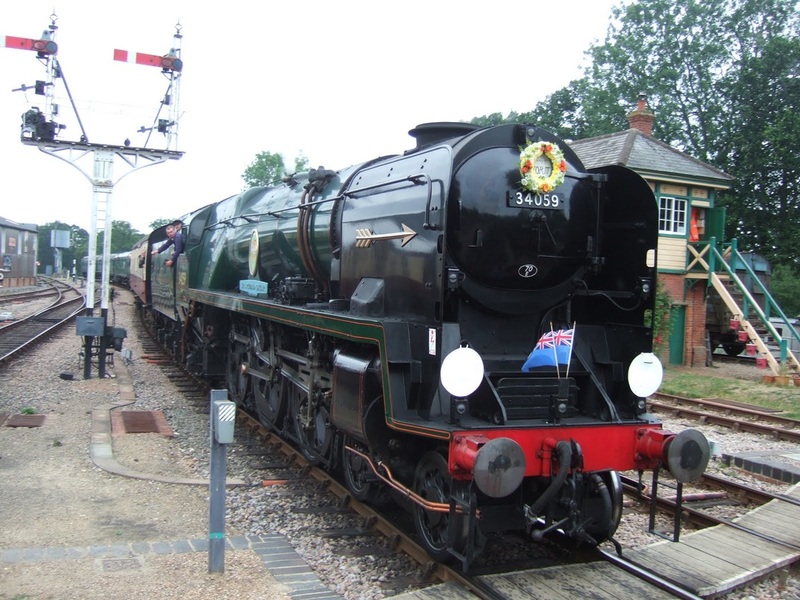 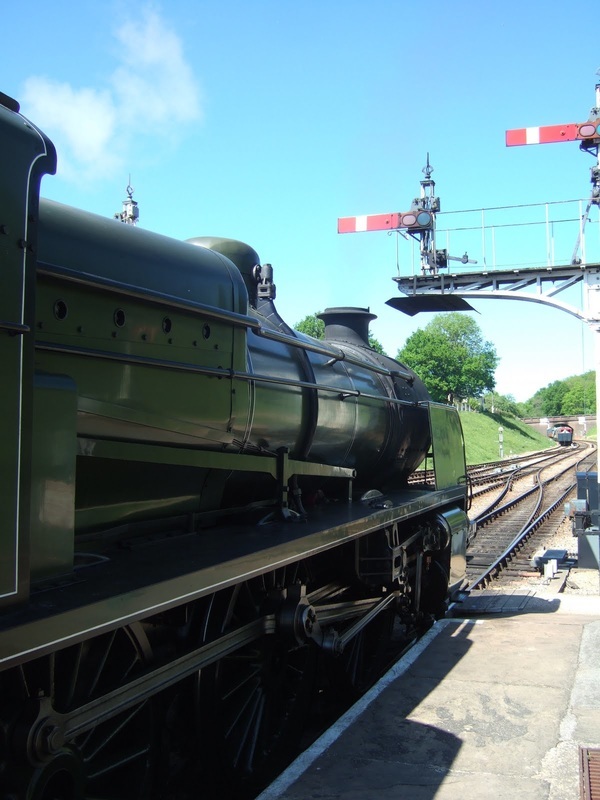 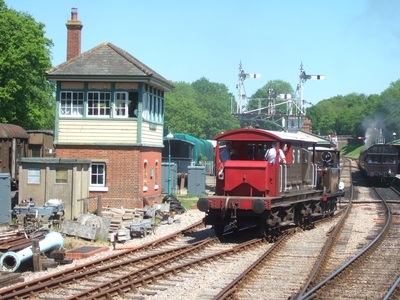 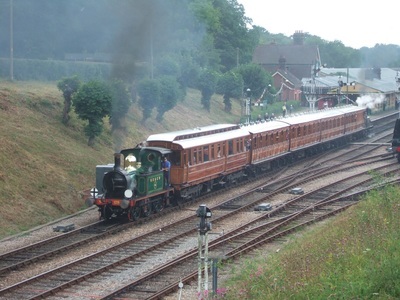 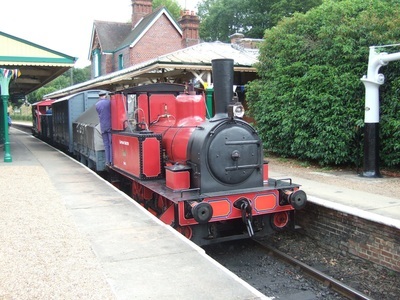 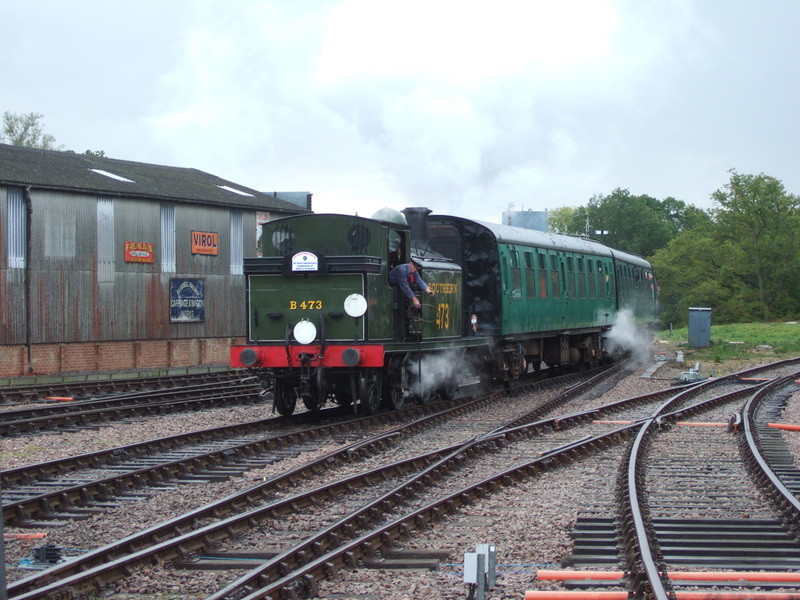 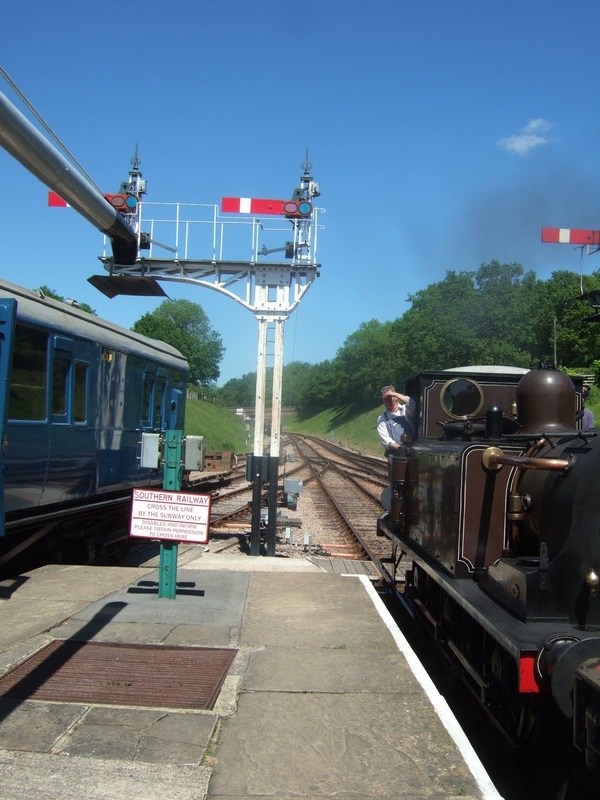 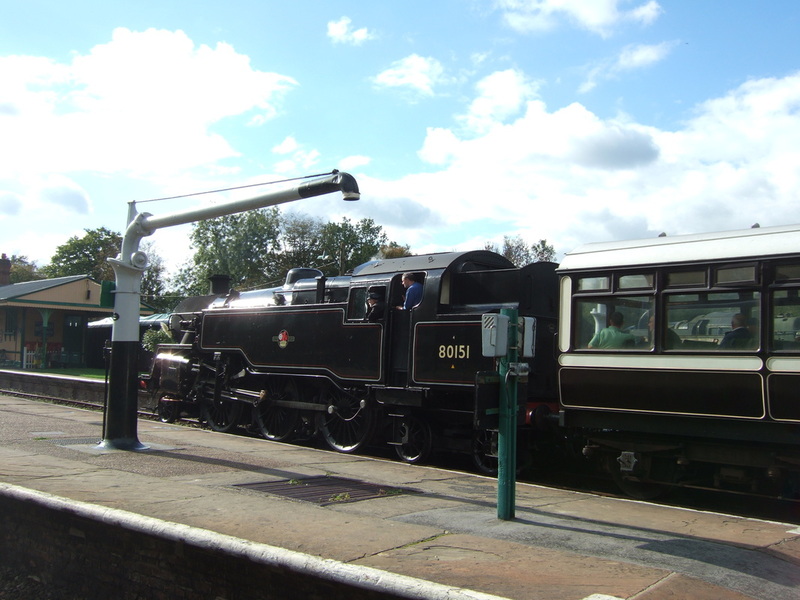 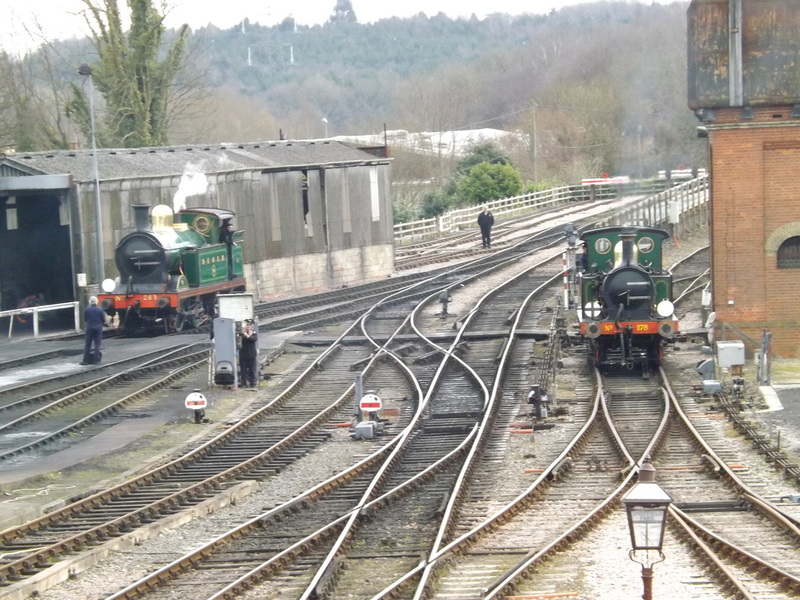 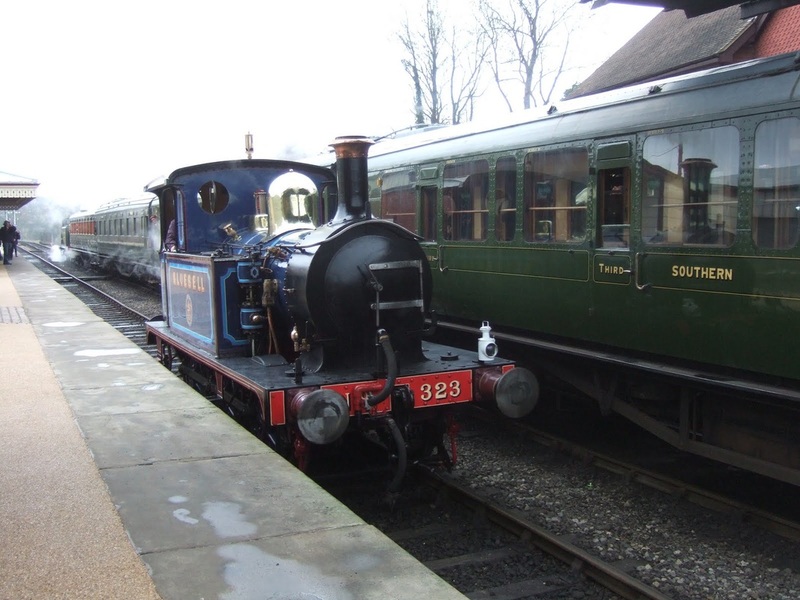 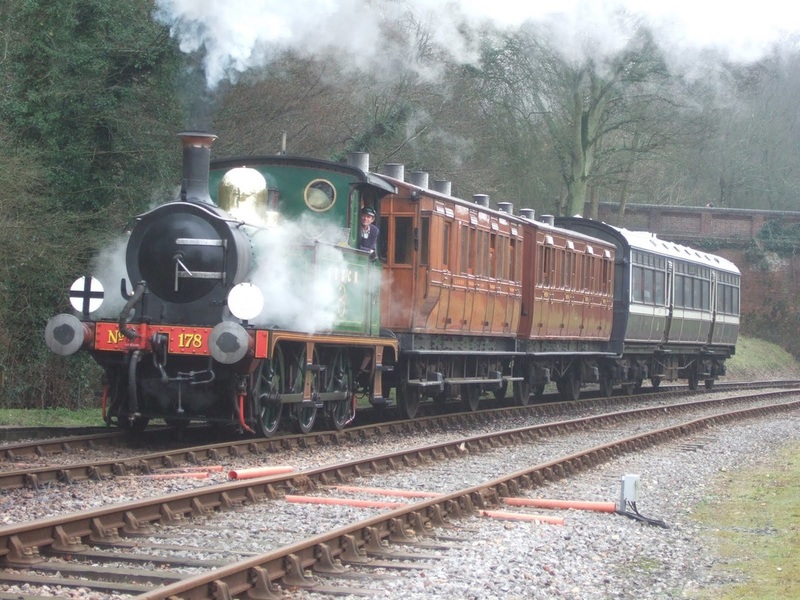 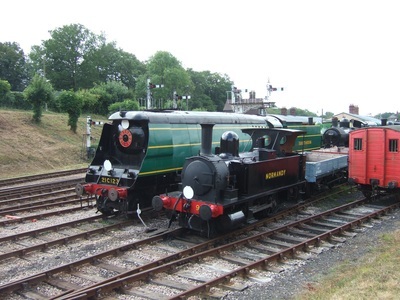 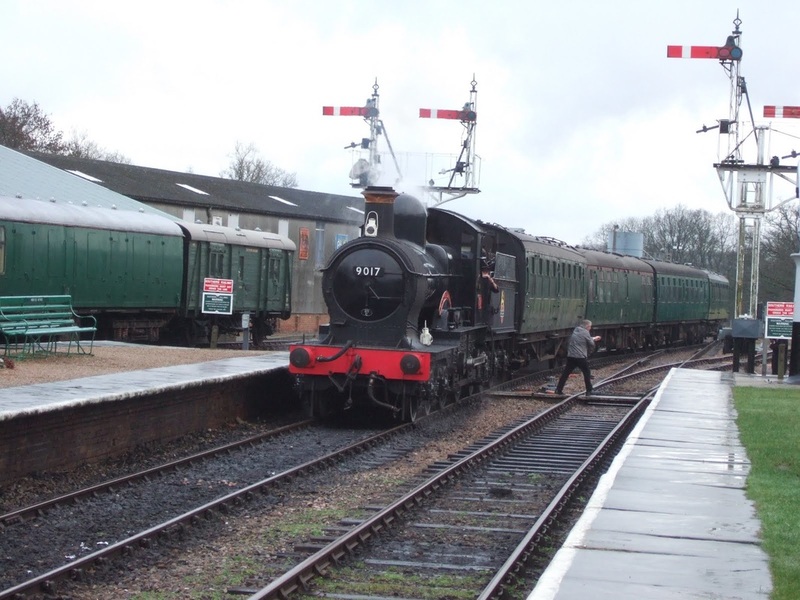 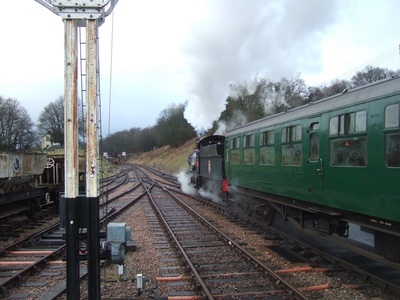 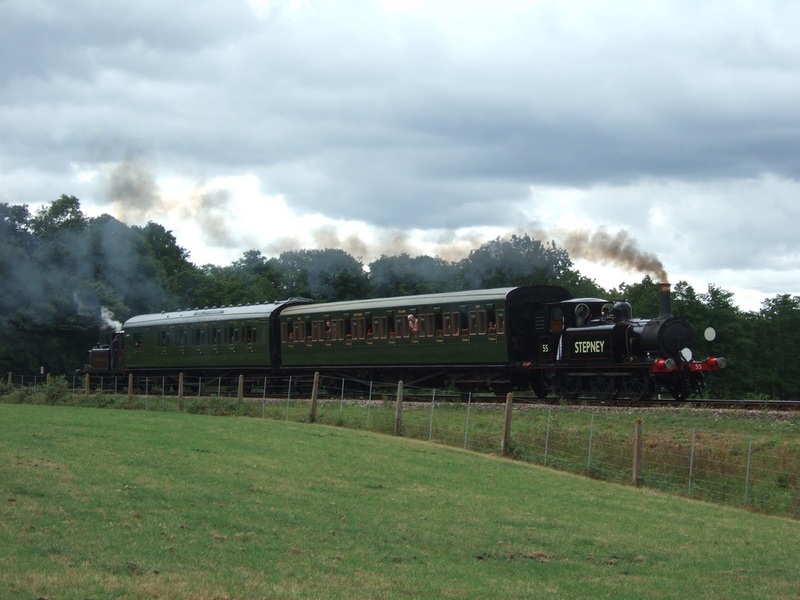 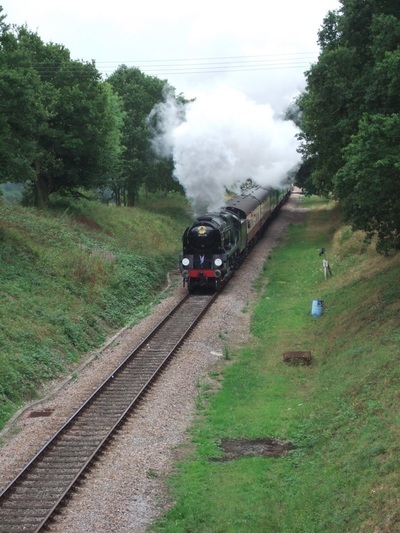 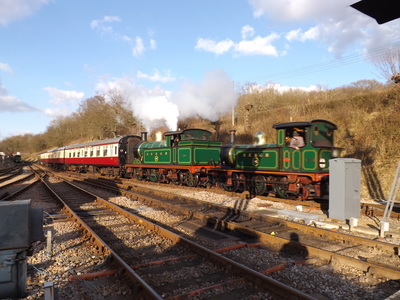 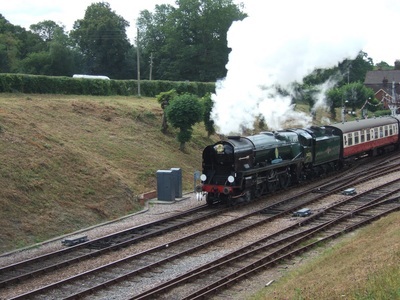 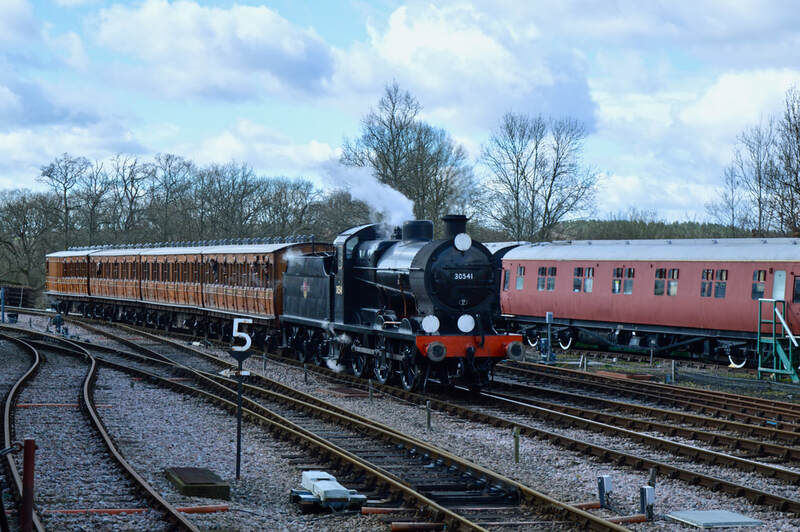 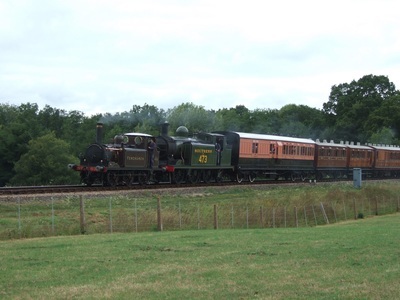 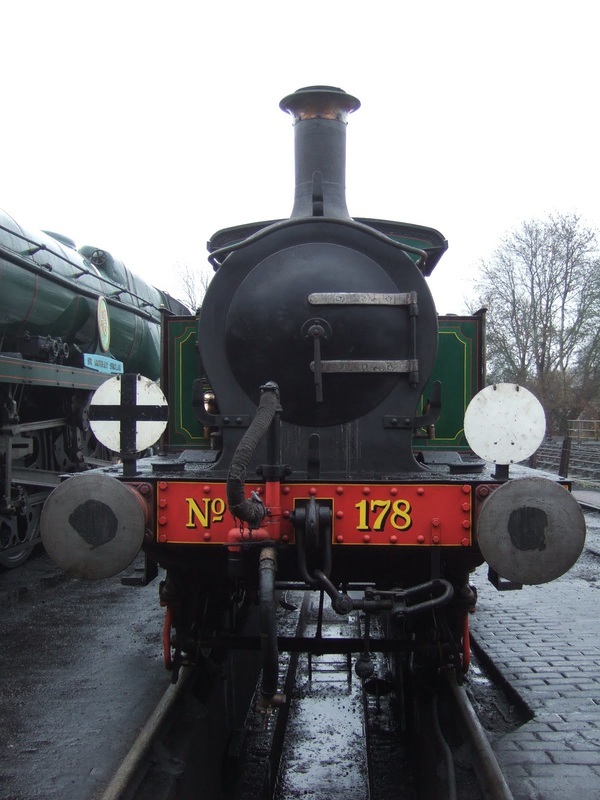 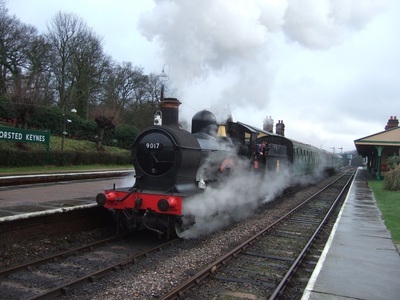 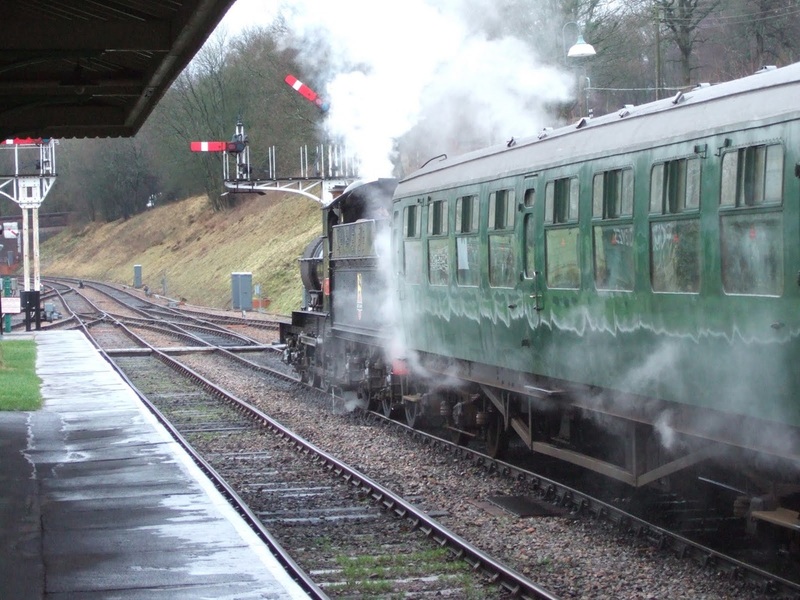 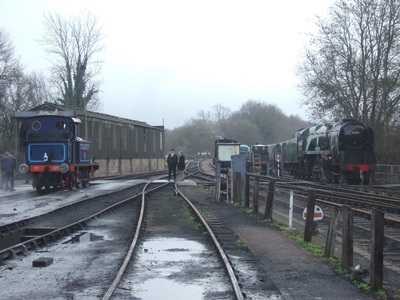 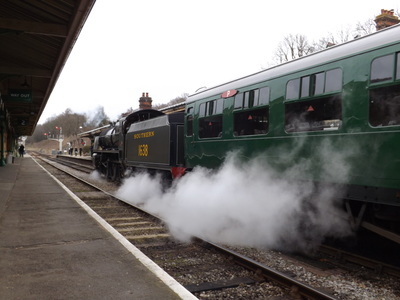 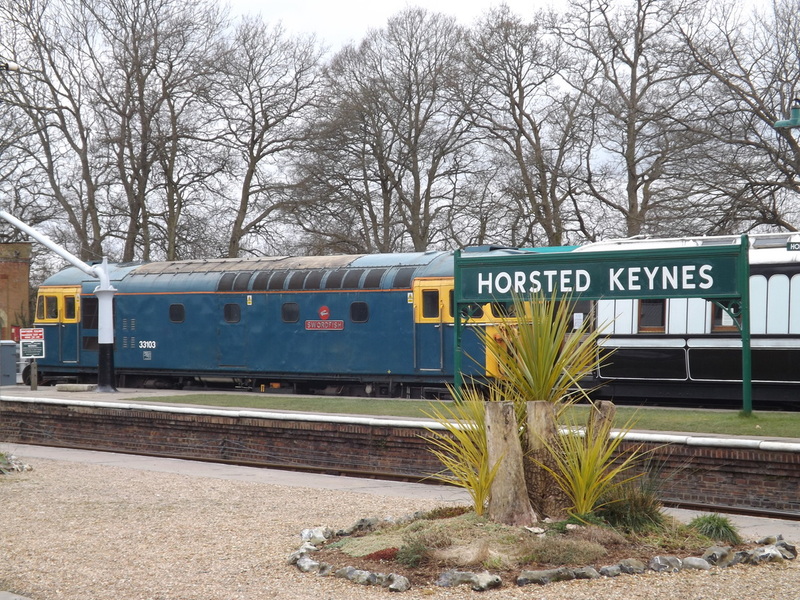 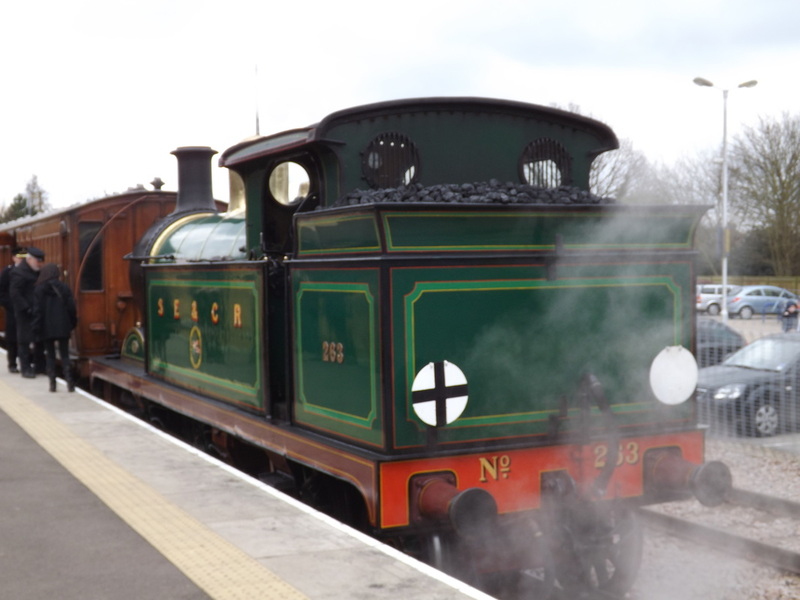 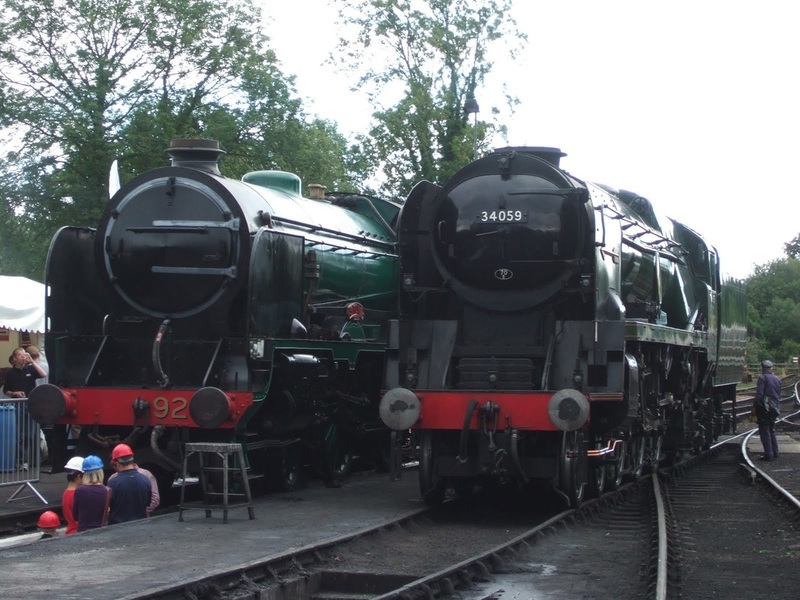 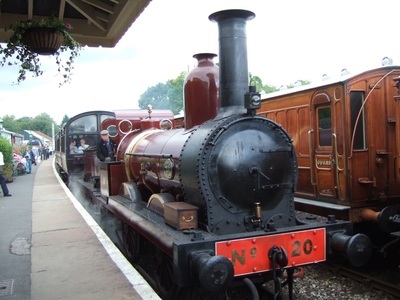 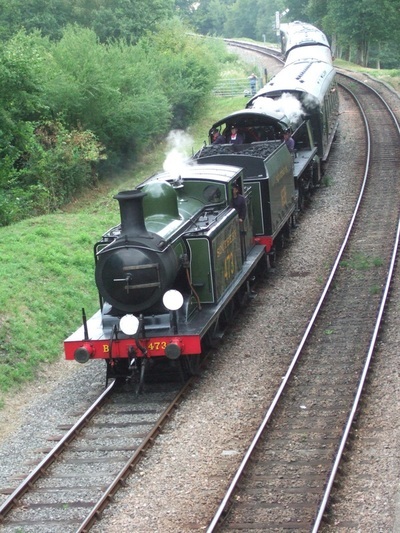 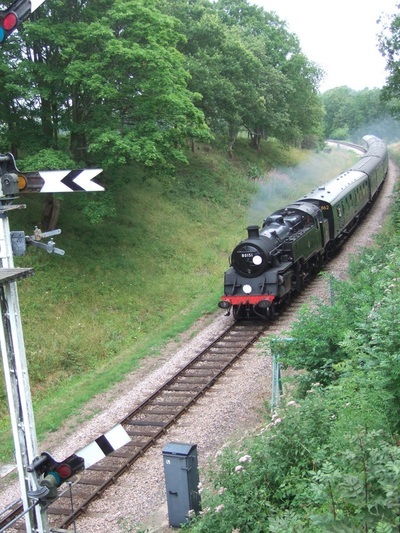 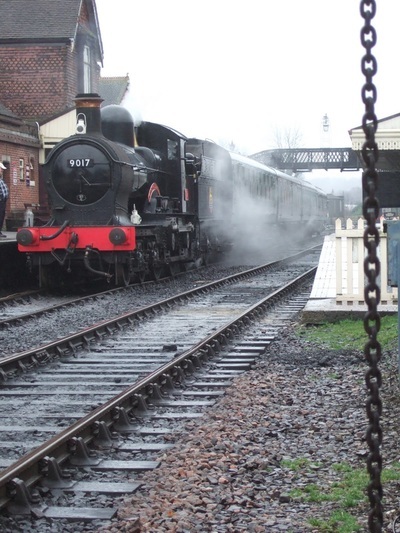 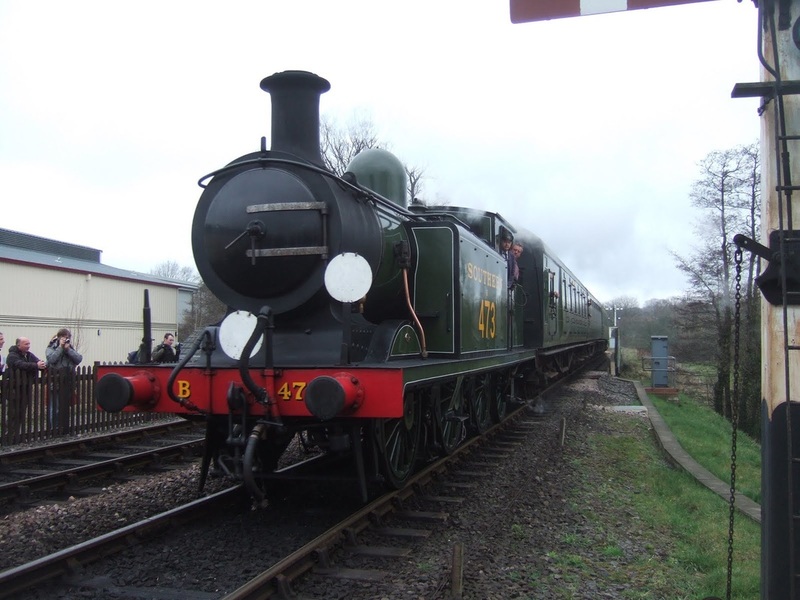 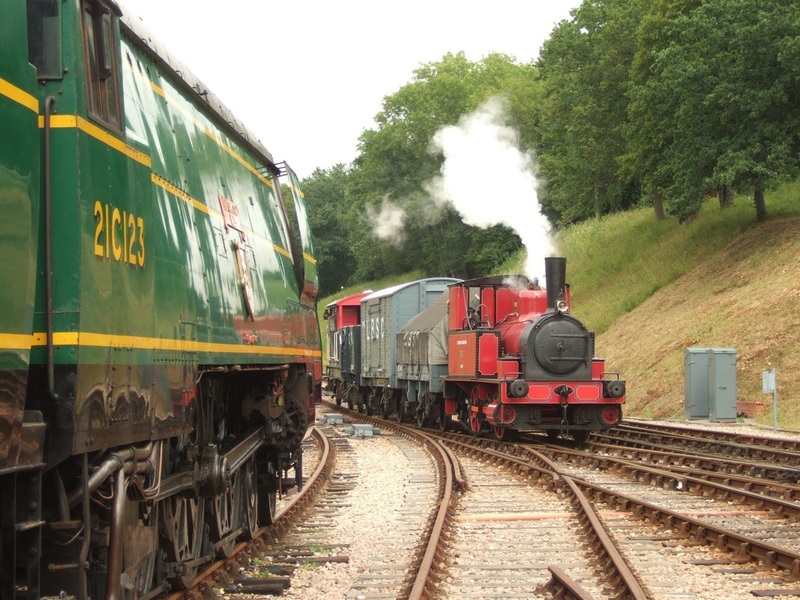 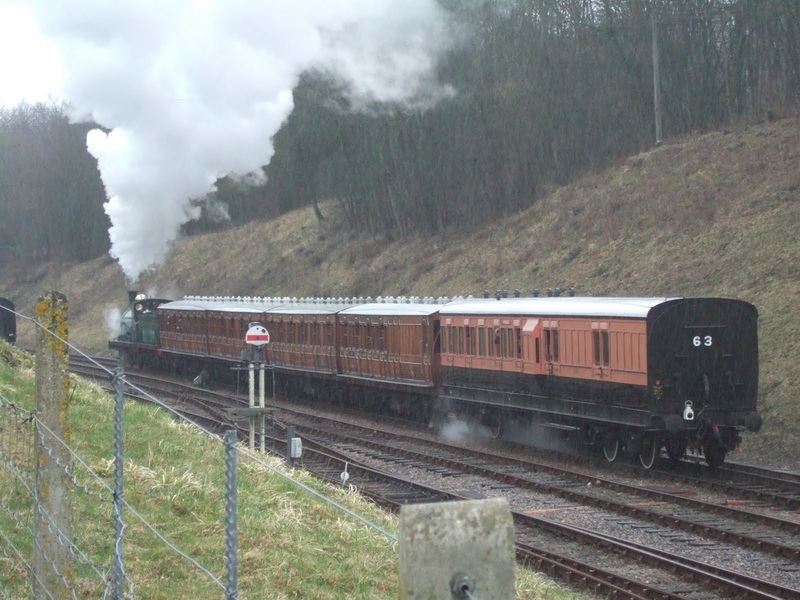 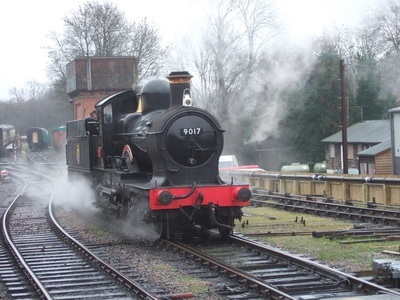 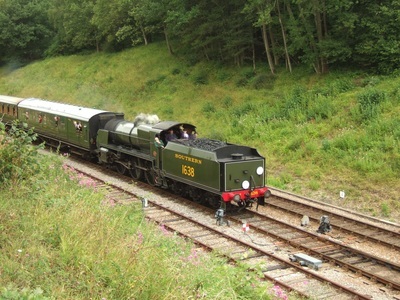 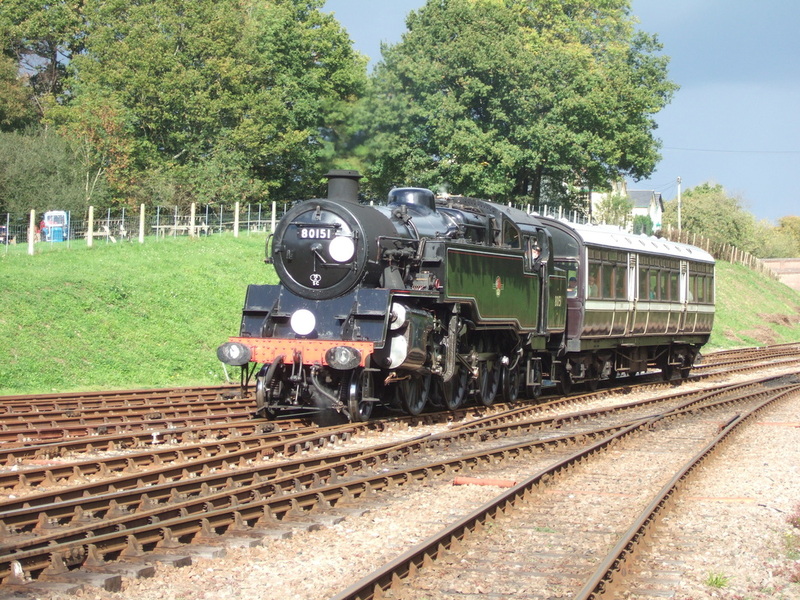 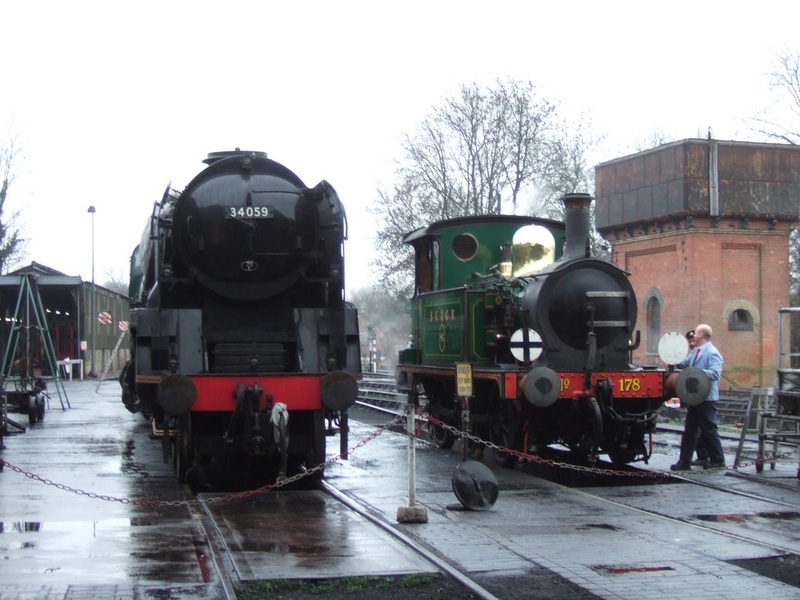 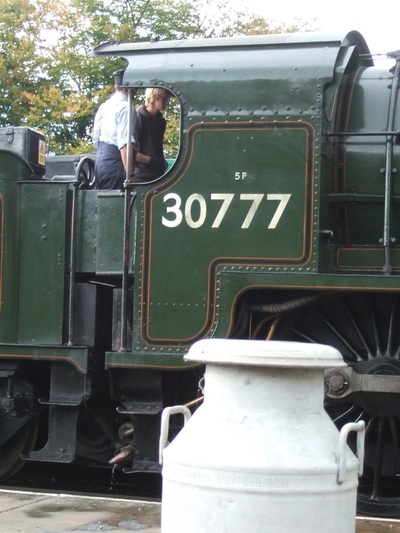 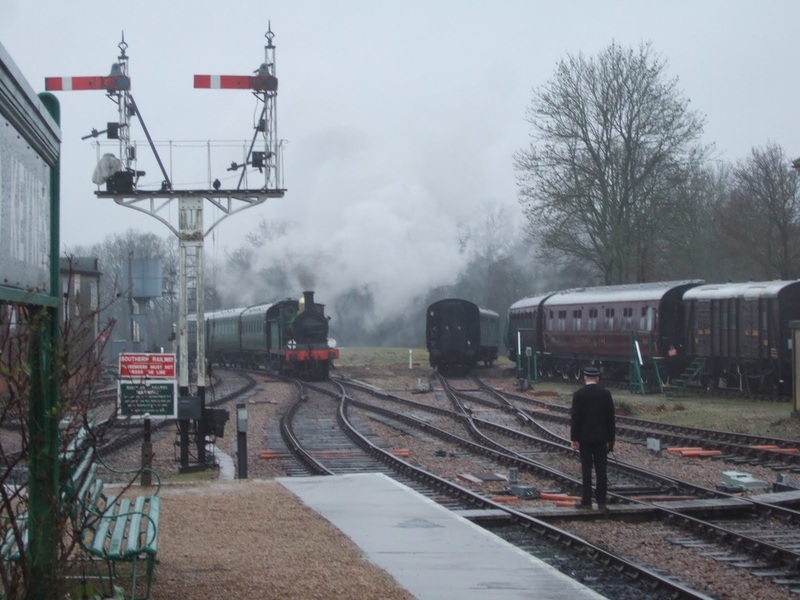 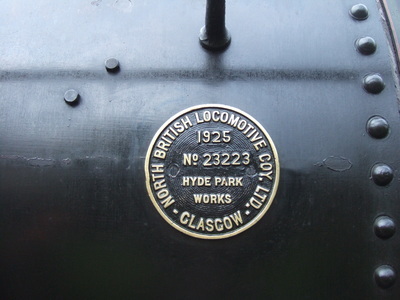 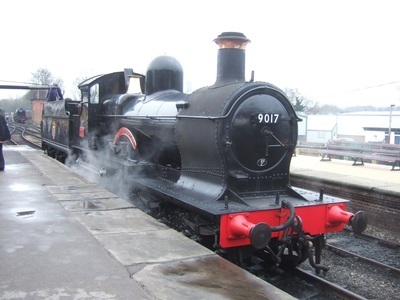 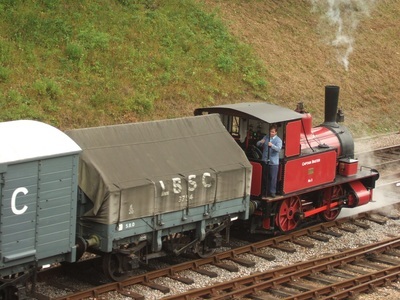 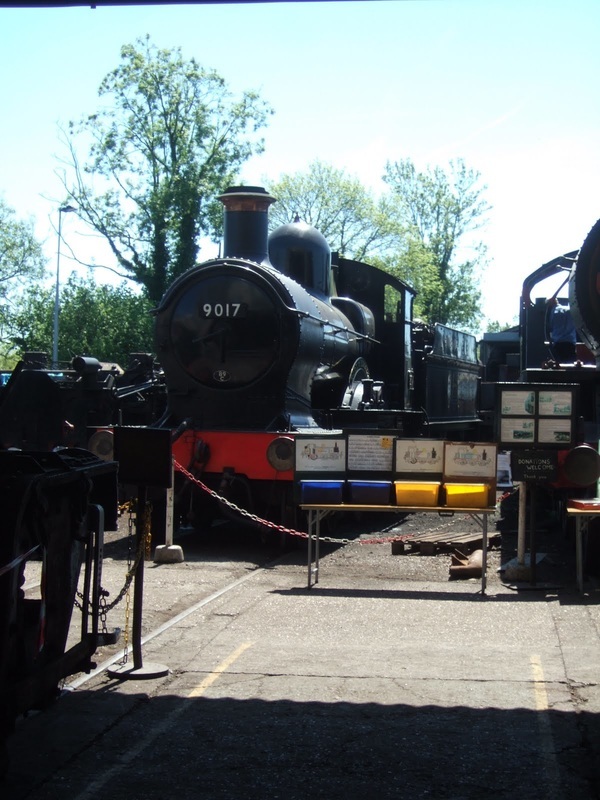 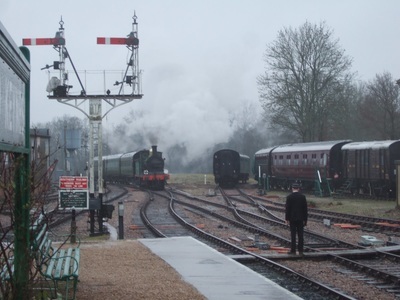 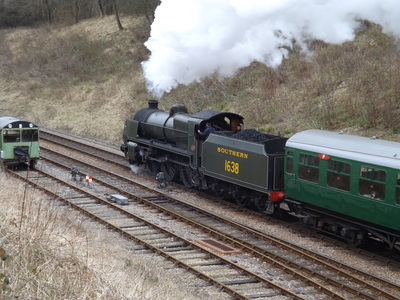 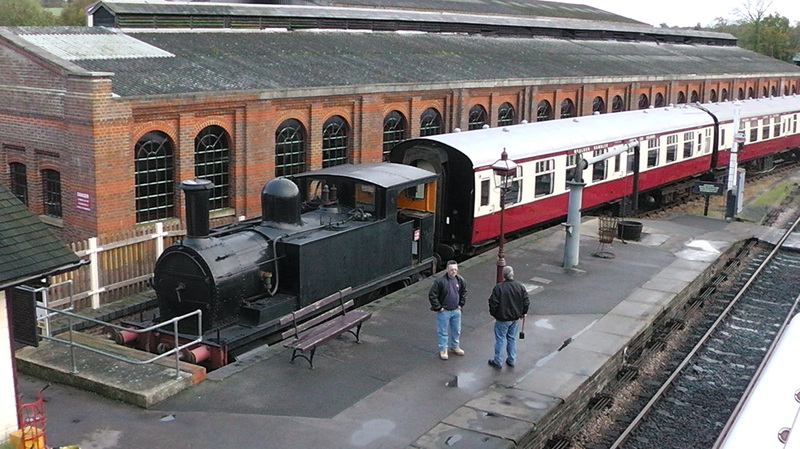 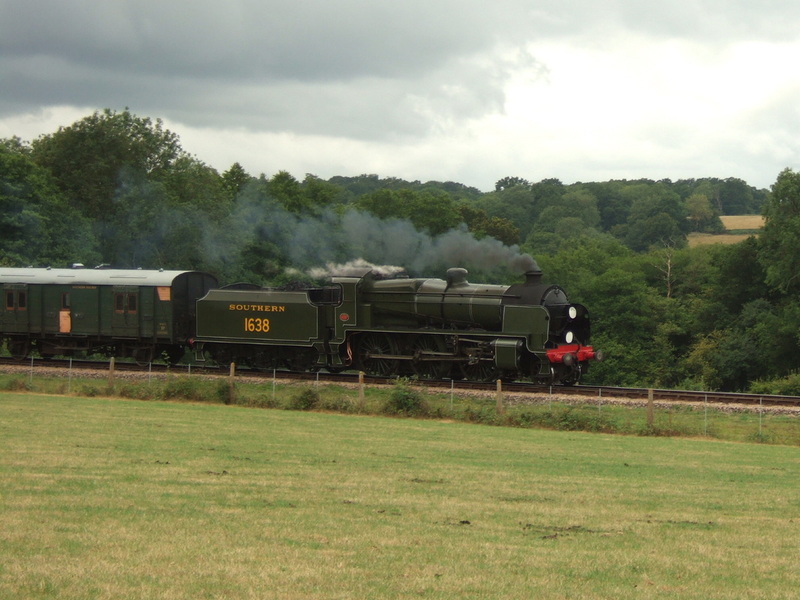 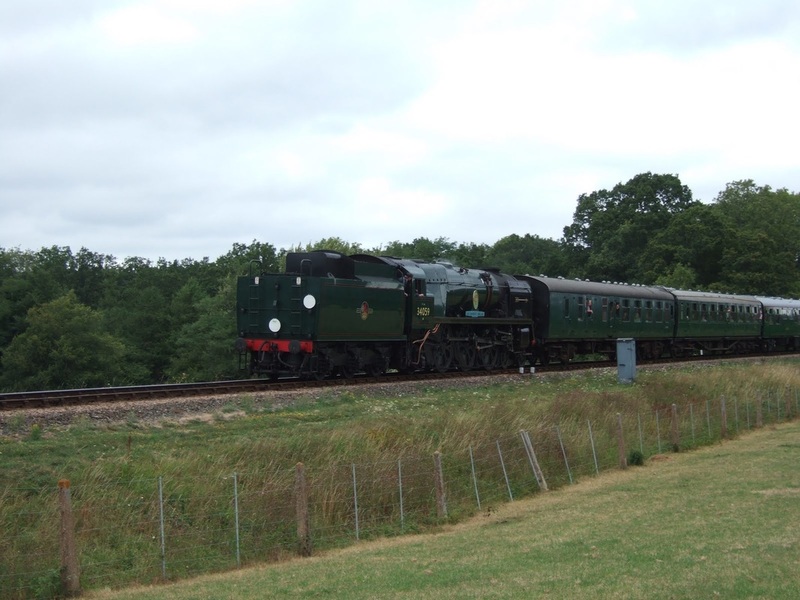 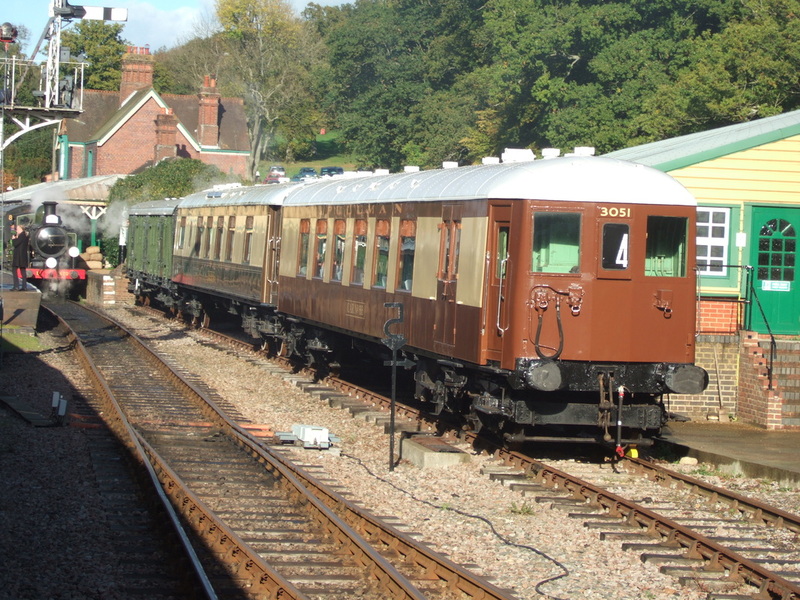 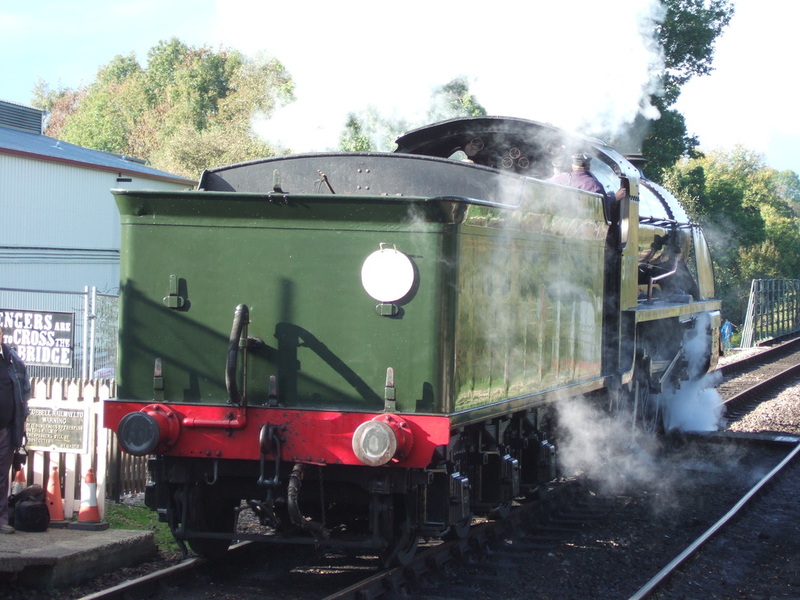 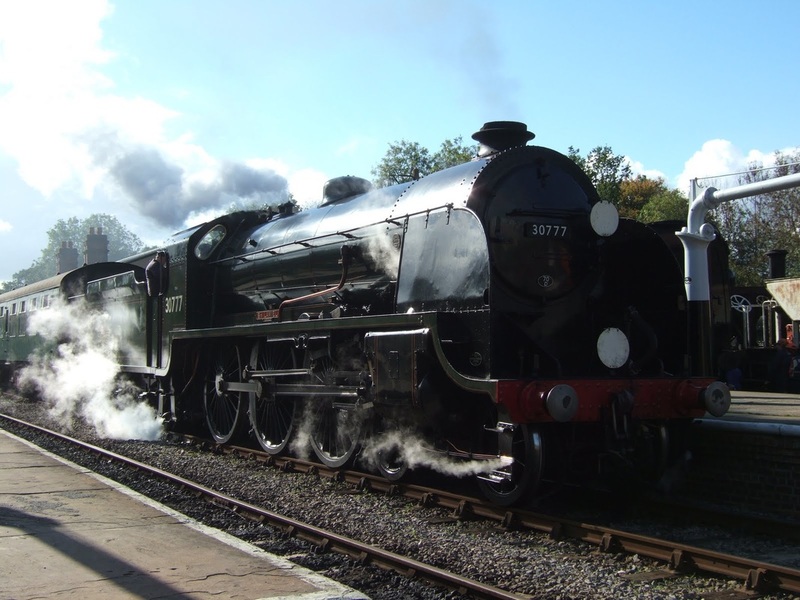 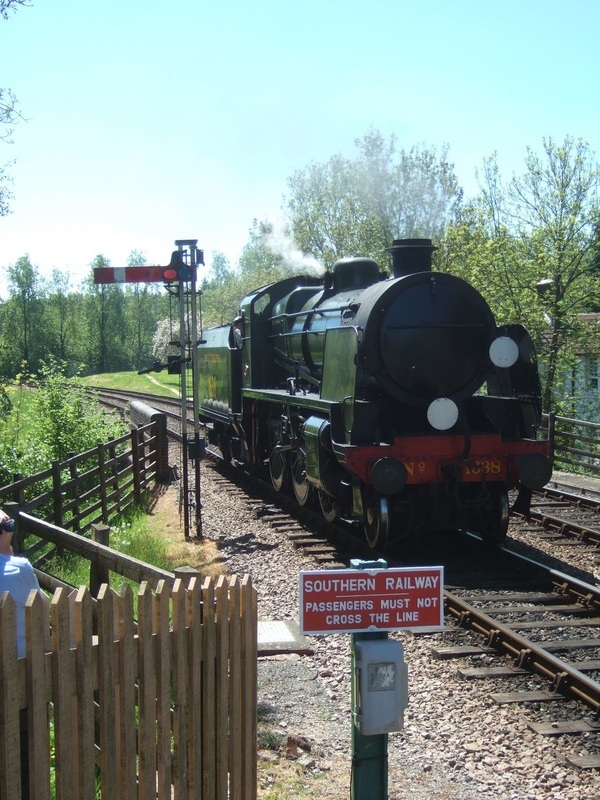 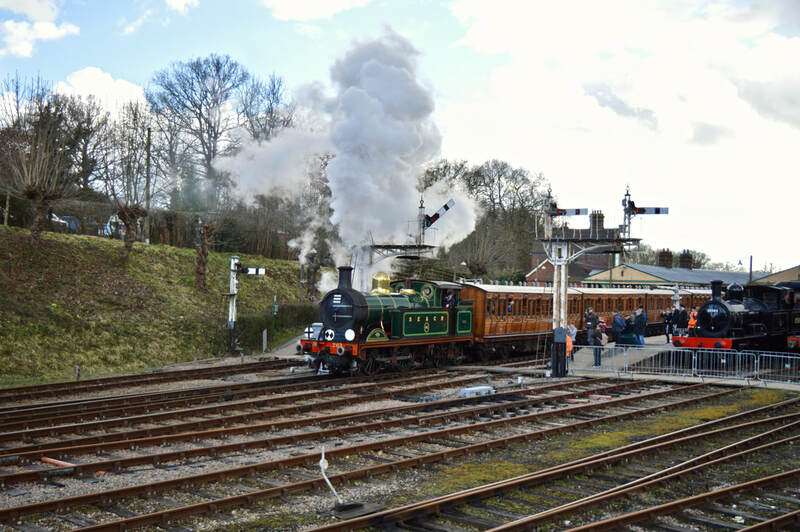 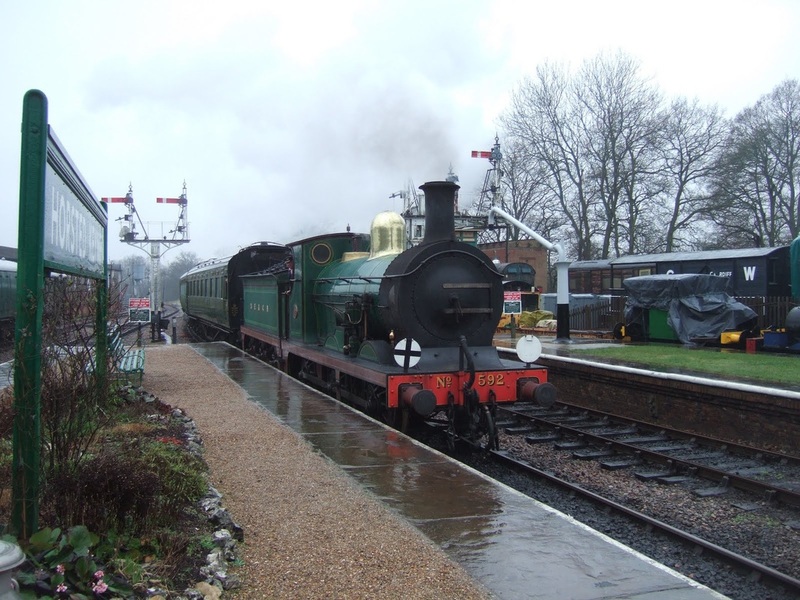 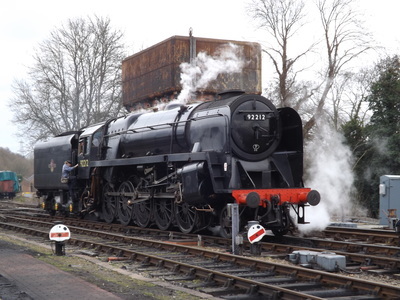 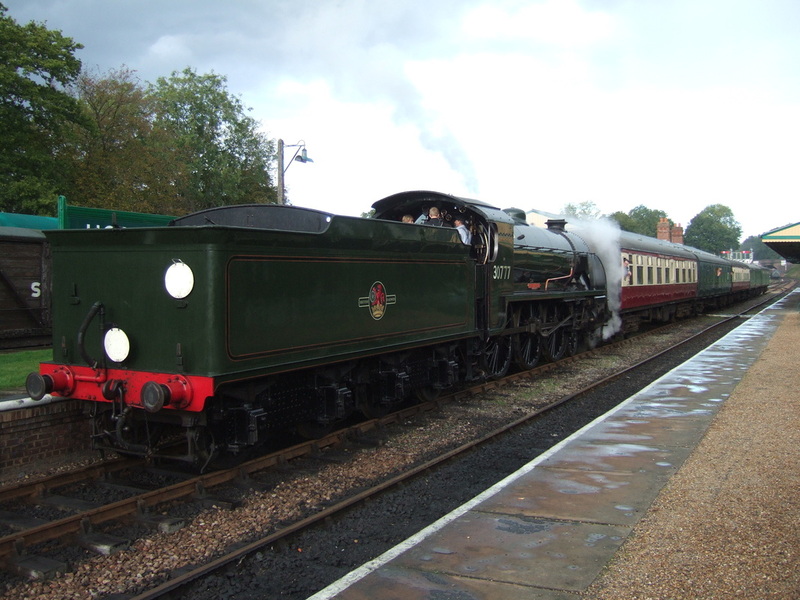 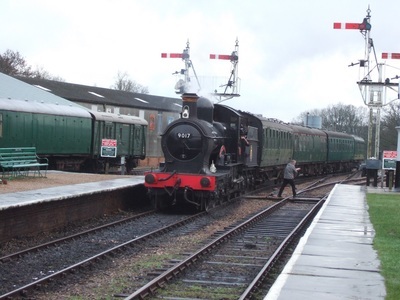 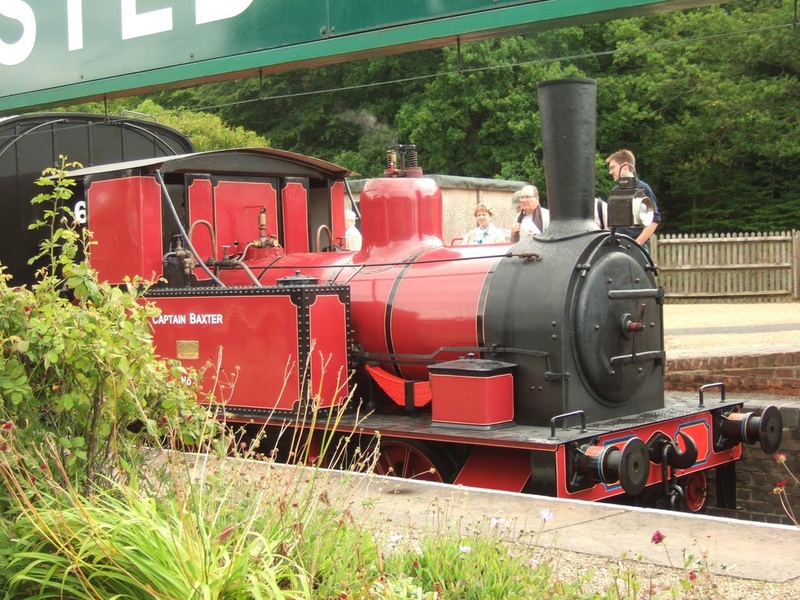 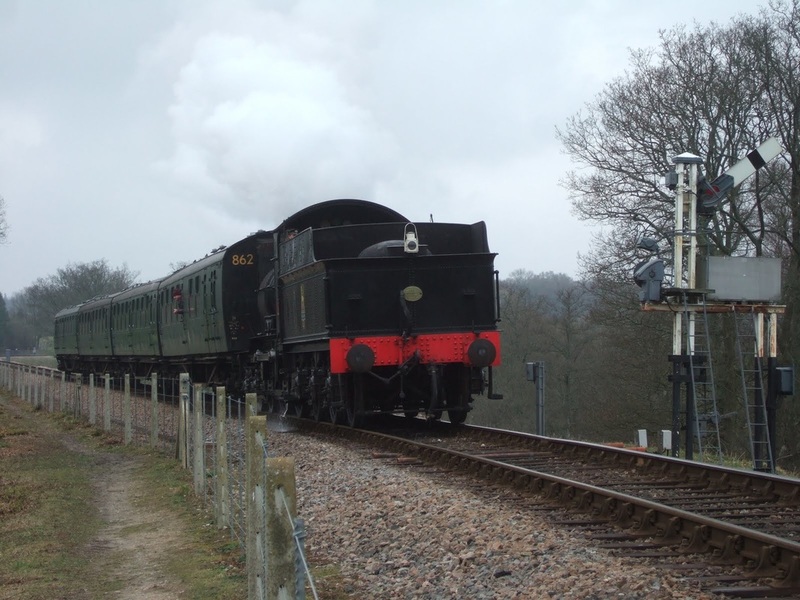 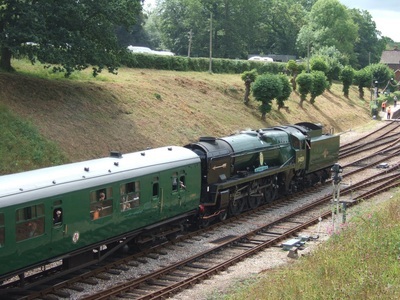 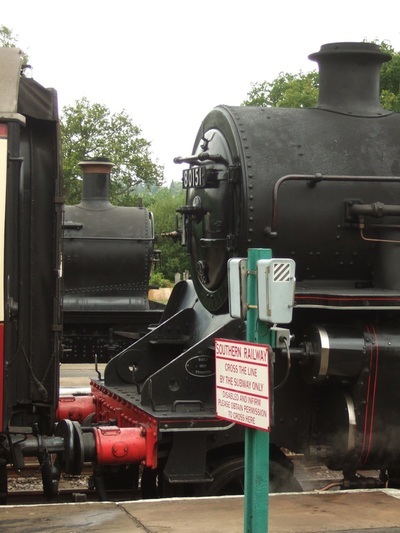 At the time of reopening Horsted Keynes was still served by British Railways electric services from Haywards Heath, and when permission was granted for Bluebell Railway services to use the station in 1962, this gave a junction with the national network. 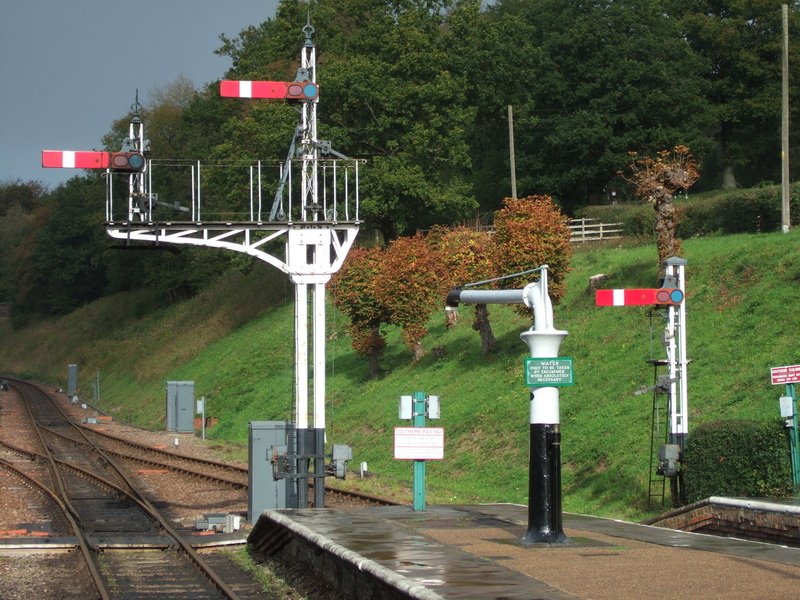 This disappeared the following year with the closure of the electric branch. 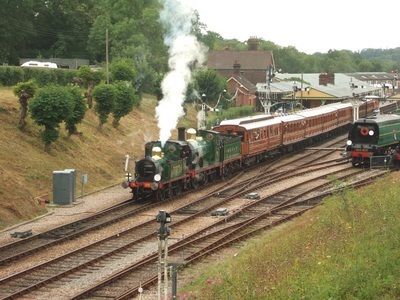 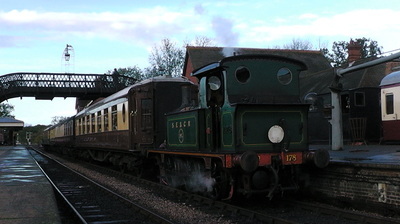 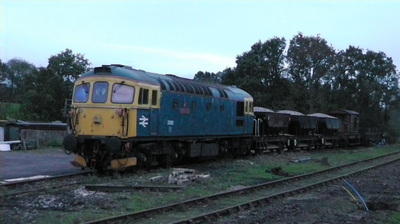 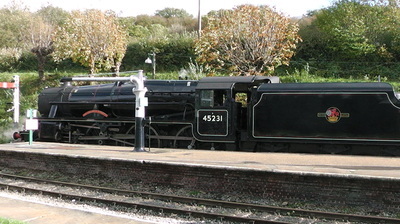 This left the Bluebell without a connection to the national network until 2013, when the line extended north (first to Kingscote in 1994) to East Grinstead. 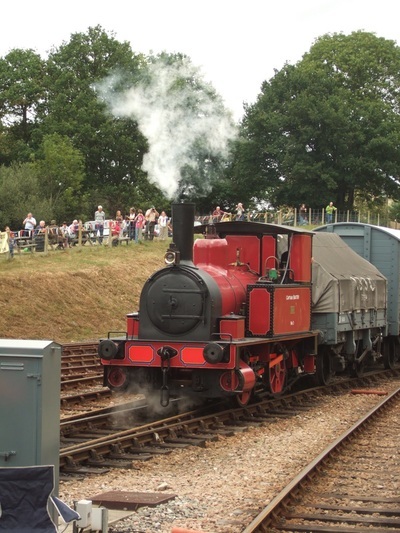 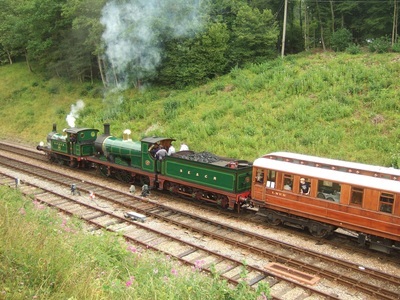 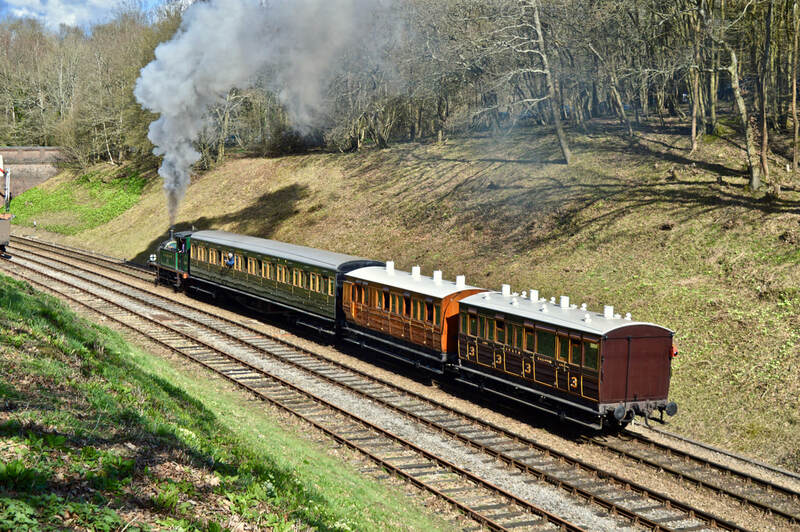 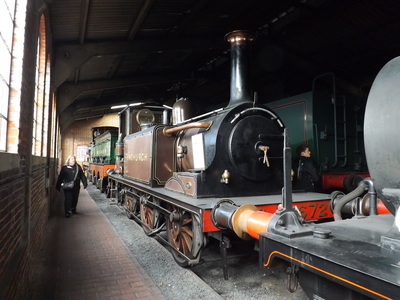 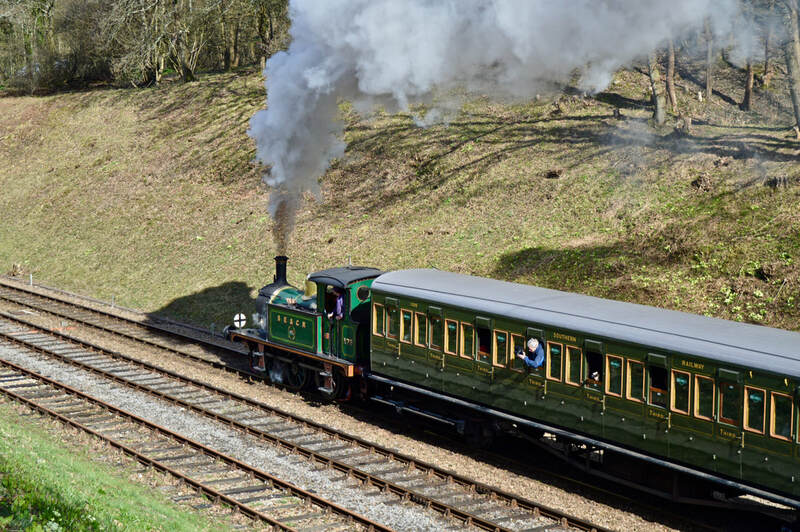 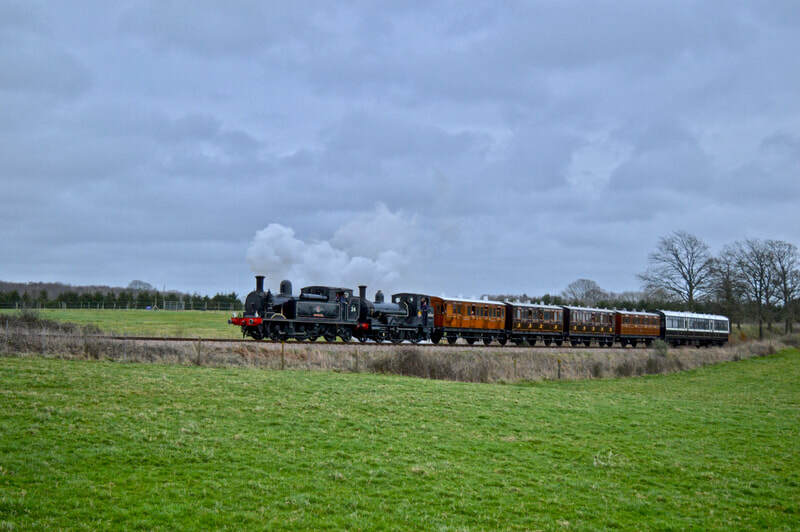 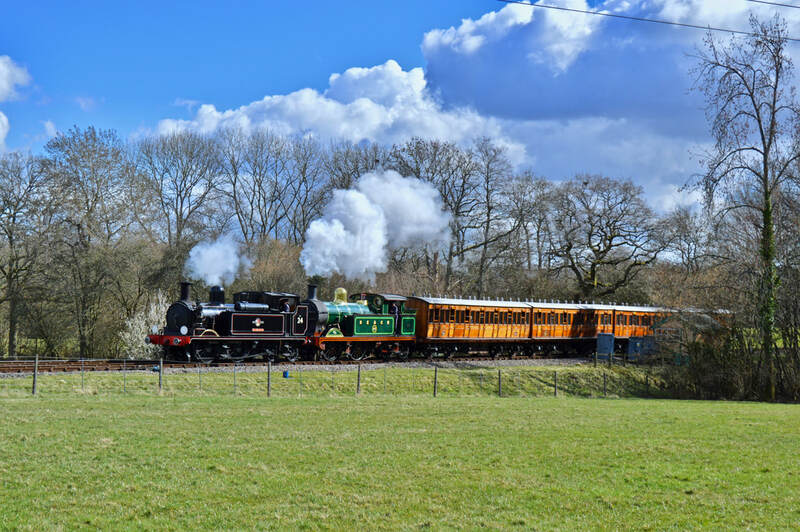 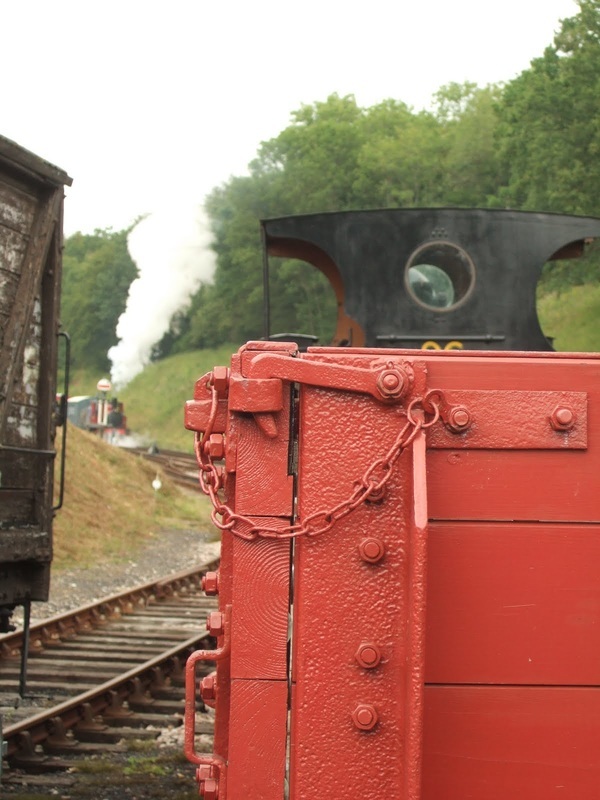 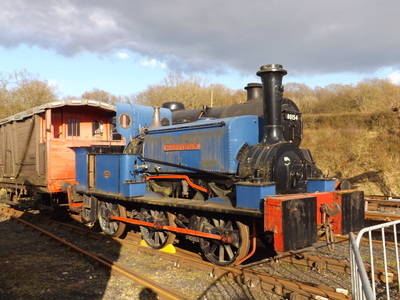 The line is famous for staring in many films and television series, but to enthusiasts its collection of carriages and locomotives is second to none.